Noticed something interesting, on this website, or on the water? Please join the list of contributors. An ocean glider was deployed offshore from Hinchinbrook Island on the Great Barrier Reef just a few weeks after the unprecedented rains in February. It sampled what was left of the fresh water plume and unexpectedly revealed the effect of a couple of weeks of clear skies and light winds in the region (Figure 1). Despite the 12d delay since the rains the glider found an 8m deep plume of relatively fresh water. It also found that water was 3°C warmer than satellite and ship measurements of temperature just 2 weeks earlier on Feb 10. Diurnal warming is evident in the Four-hour SST over the shelf after the rain stopped. For example, soon after the rain on Feb 14 (Figure 2) SST is well over 31°C while just 1.9m below the surface, ship temperatures were up to 4° cooler. 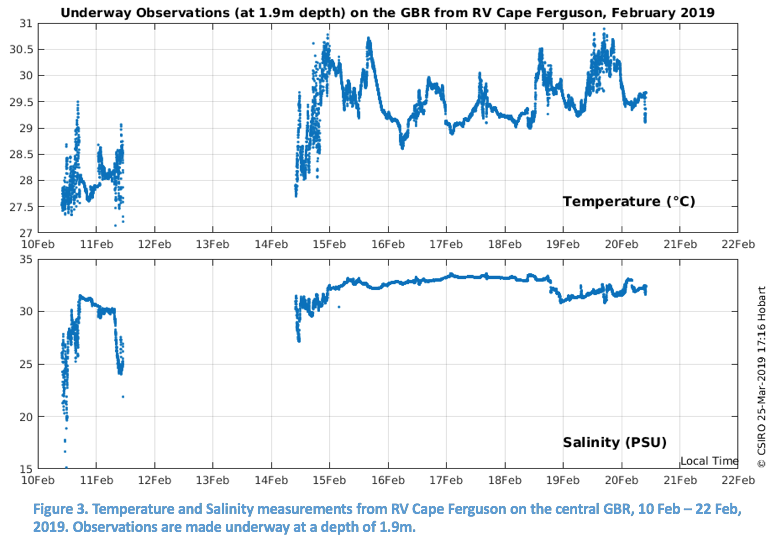 The classic signature of water column warming through solar heating is also indicated by ship observations from RV Cape Ferguson while it stayed in a channel in the outer reef for a number of days. Temperatures peak in the afternoon and then reduce overnight (Figure 3) as heat loss and convective mixing occurs. The gradual warming of the sub-surface layer is evident in the increasing temperature of the overnight low. Given the freshwater in the glider time series is also very warm, we might assume that the runoff had been warm relative to the reef water and contributed to faster heating. Observations from RV Solander in early February indicate that the opposite is true. The ship measured a fairly steady 27.5°C everywhere that salinity was in the normal range but when the intake was fresh, temperatures were as low as 15°C. It is more likely then, that the strong salinity gradient due to the plume and the temperature gradient due to surface heating, combined to form a highly stratified system that inhibits mixing, particularly given winds were weak at the time. Furthermore, incoming shortwave energy is attenuated in the upper 1-2m of the river plume water due to its dark color, further enhancing the stratification. 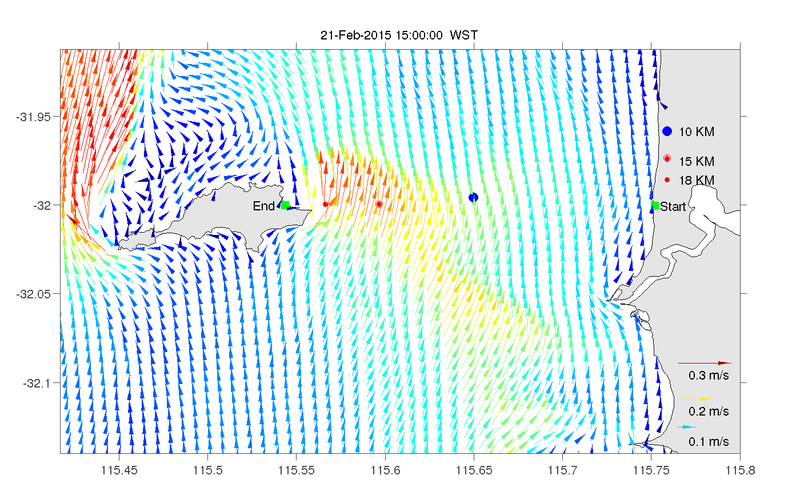 The glider observed the dissipation of the heat with the strong south-easterly change that came through after Feb 25 which mixed the entire water column and eventually brought cool water from the outer reef into the region. And as the winds calmed in mid-March the beginning of diurnal heating can be seen again. As for the fresh plume, it disappears with the strong winds and yet shelf salinity was still sub-35 PSU, well below the normal salinity range, for the remainder of the deployment. The GBR has had a welcome reprieve from the heat this year with below-average Sea Surface Temperatures particularly in January and February (see right, 17 Feb SST Percentiles), the time when water temperatures on the reef are usually at their maximum. Since the damaging coral bleaching summers of 2016 and 2017 on the GBR, researchers and managers have paid close attention to the seasonal forecast for SST as summer approaches. Coming into this summer, the November outlook was for moderate warming (0.5°C above average) throughout the GBR but by early December, SST percentiles indicated temperatures turned out to be significantly warmer (in the highest 20%) than the forecast. Cyclone Owen, however, put a stop to that when it passed through the region just a few days later and then again on Dec 15. Further heating throughout the summer was limited by the stable monsoon trough that developed over North Queensland and then Tropical Cyclones Penny, Oma and now Trevor. The cyclones and the monsoon both provide heavy cloud cover that blocks solar heating and the strong winds cool the surface by vertically mixing cool water from below the thermocline. Of course, monsoons and cyclones also bring rain and this season the rainfall was unprecedented. There was runoff onto the reef all along the coast but particularly from the Burdekin River which has a catchment area west of the Great Dividing Range. 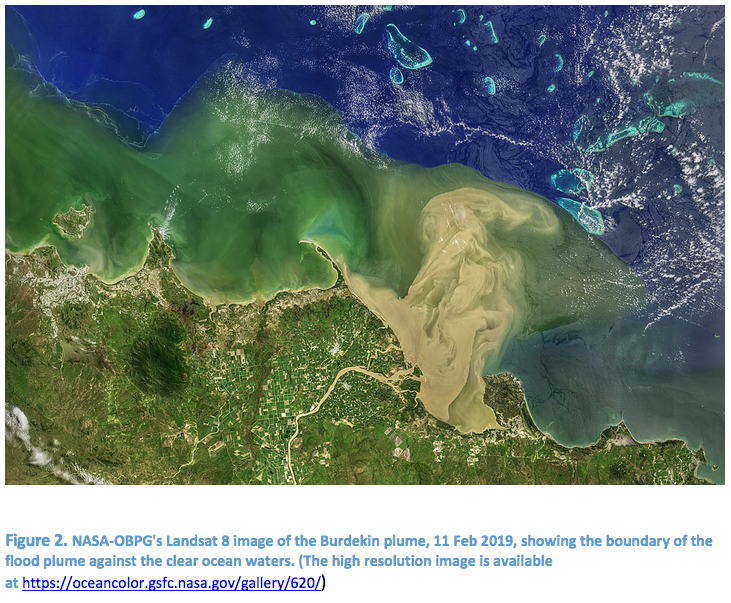 On Feb 11, the sediment laden plume was seen to extend 60km across the shelf (Figure 2) and a few days later, after the wind turned offshore, it reached all the way to Gould Reef on the outer shelf. Inshore regions often feel the effects of the runoff plumes but it is unusual for them to affect the outer reef. The sediment in the river plumes will eventually settle out, potentially smothering seagrasses and corals. The plume waters themselves bring nutrients and often result in large increases in microbial and planktonic blooms. On the positive side, benefits include increased prawn production and food for other larvae. Swim conditions for the Port-to-Pub this Saturday could be challenging! 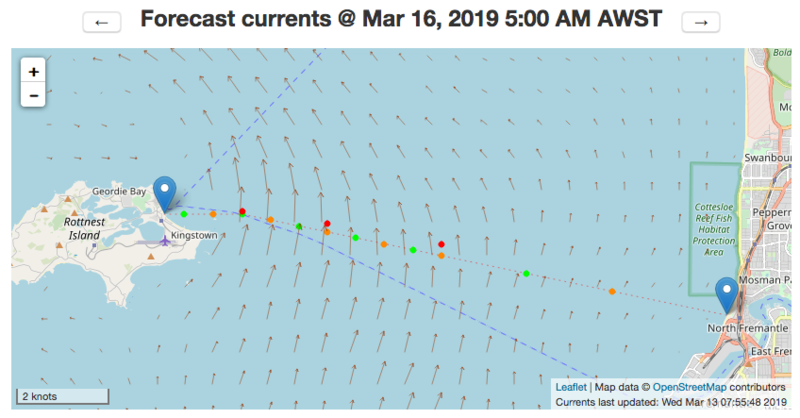 The ocean current forecast from the Oceans Institute of UWA is for strong northward currents for the second half of the course throughout the day (check the swim optimiser for hourly ocean currents). From the BoM, the forecast is for fresh southerly winds (up to 20kn) throughout the day and total wave height (swell + wind waves) of 1.5-2m from the southwest. So it could be quite choppy with a strong push to the north. Air temperatures are forecast to be warm, 27°C at the coast, and ocean temperatures off Perth have warmed a little lately to 22.5°C, average for this time of year. The Tasman Sea experienced another burst of solar heating this year, very similar to January last year, when sea surface temperatures were more than 3°C above average in a large area, around New Zealand. Both heating events occurred under the influence of a blocking high in the Tasman but the location of the high and the nature of the disruptions to the high created quite different conditions off the west coast of New Zealand (Figure 1). In 2018, satellite SST shows surface water off the west coast was more than 3°C above average for the last 10 days of January and coastal waters remained 2-3°C above average for almost all of February. This year, although the central Tasman peaked at 2-3°C above average, coastal temperatures were cooler than average (by up to 3°C) and have remained cool for much of February. In January 2018, the blocking high was at first centred in the Tasman Sea but by mid-January it had established itself just east of New Zealand. It was also preceded by a series of weak low pressure cells (e.g. 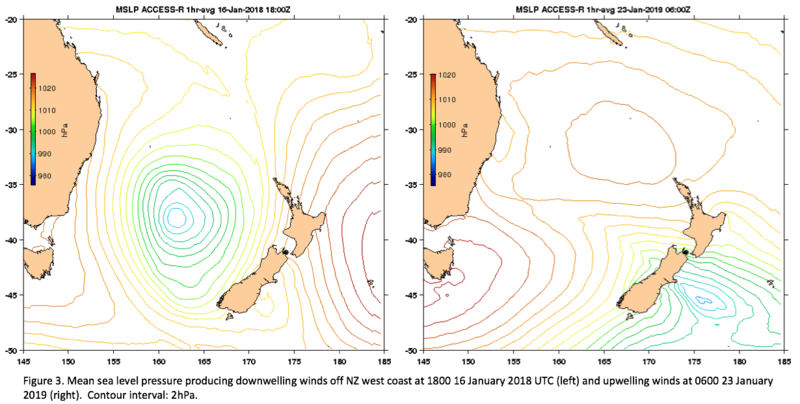 Figure 3, left) that created a period of about 10 days of downwelling winds along the west coast of South Island (Figure 2, top). 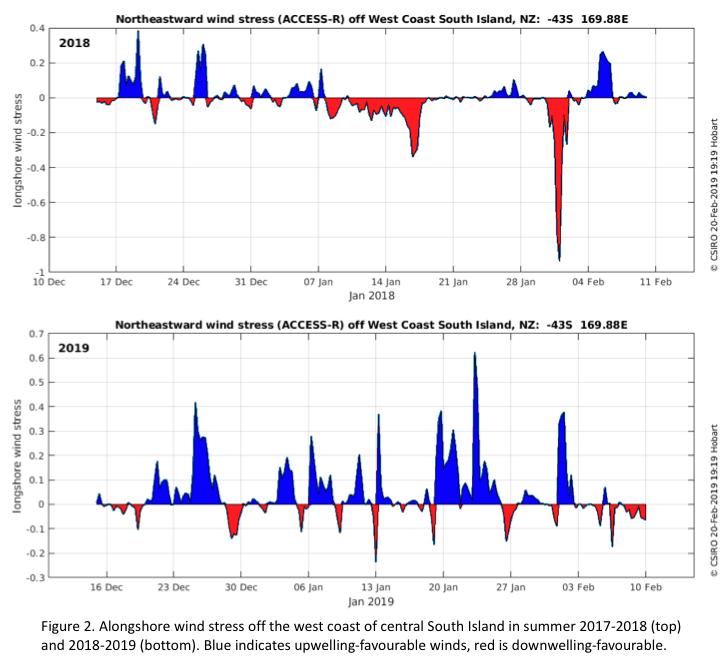 In contrast, in January 2019, the blocking high remained over the centre of the Tasman and throughout the month and South Island experienced a series of south-westerly wind episodes (Figure 2, bottom) caused by disturbances in the air flow south of New Zealand (e.g. Figure 3, right). 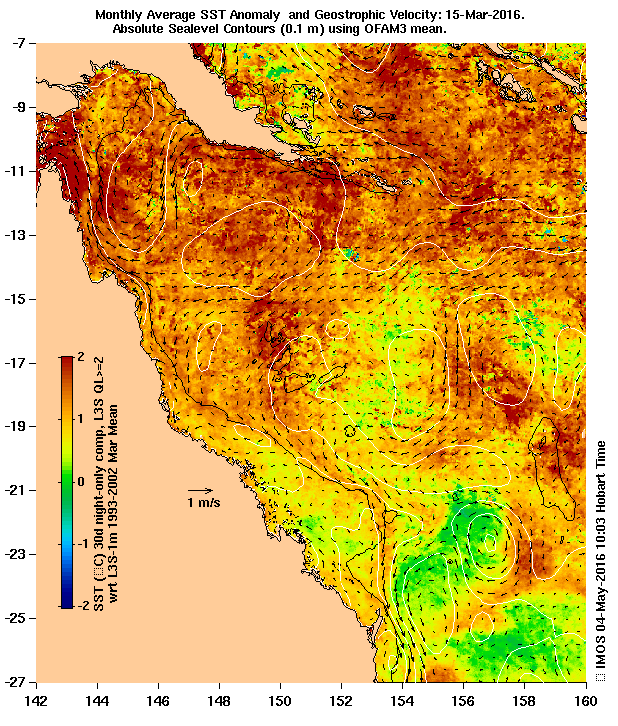 The upwelling induced by the south-westerly winds was quite strong for this time of year as the SST percentiles indicate temperatures in the lowest 20% for much of the west coast. The SAM, or Southern Annular Mode, is considered to be the strongest indicator for blocking highs in the Tasman (Salinger et al, 2019)¹. There is an increasing trend in the SAM with climate change so it is thought that marine heat waves associated with blocking highs could become more prevalent. The SAM index was high in both January 2018 (2.72) and January 2019 (2.79) and although blocking highs were present in both years they were very different in character and produced different local outcomes. Upwelling has always been valued for bringing nutrients up to the surface, fuelling ocean production, but as ocean temperatures rise the cooling effect is also important. With the prospect of more blocking highs in the Tasman, a predominance of one type of block over the other could make a difference to temperatures and productivity in the coastal waters of New Zealand. Conditions are looking good for the swim this year. A weak (<0.5knot) northward current in the second half of the race that turns northwestward around midday may even provide a gentle push in the middle of the race for swimmers still in the water. Neither the wind nor swell look like they will create difficult conditions. The Bureau of Meteorology is forecasting light southerly winds in the morning turning westerly, becoming moderate in the afternoon. Swell is forecast to be small: 0.5-1m from the southwest. The water appears to have warmed up a little near the coast over the last few days. However, when winds have been weak, as they have off Perth for a few days, the satellite SST may only represent a shallow surface layer. To help identify these situations, we include water temperature from ships with a hull-mounted intake whenever it is available. The latest ship SST (Feb 16, bottom right figure) from the vessel Sea Flyte indicates water temperature at 0.5m is 21.5°C, 1°C cooler than the satellite estimate of 22.5°C. This difference in temperature in the surface layer indicates recent shallow heating and the possibility of cooler waters below. However, there have been a few more days of solar heating since Feb16 due to clear skies around Perth, so the water is still warming. The forecast, of course, may change. The ocean forecast is updated each morning before the race. OceanCurrent wishes all Rottnest swimmers a safe and successful race! The Rottnest swim optimiser is up and running again this year in preparation for race day, Saturday February 23. 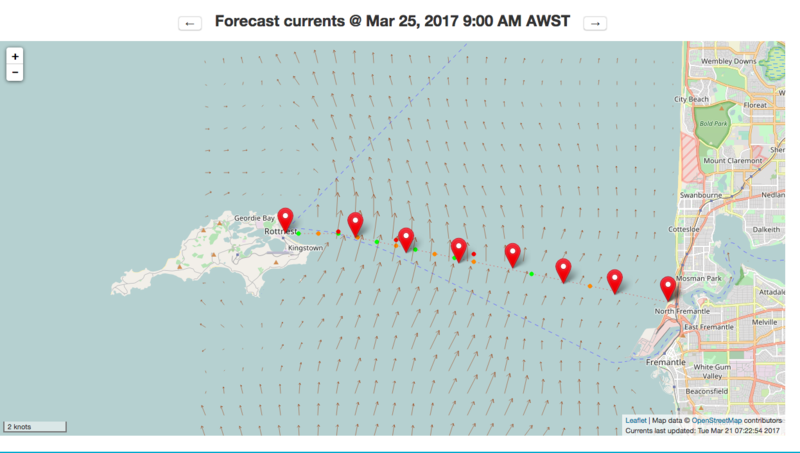 Hourly ocean current forecasts, courtesy of the Oceans Institute of UWA, are shown for the coming Saturday. The forecast for tomorrow, February 16, indicates a strong northward current in the second half of the swim, getting stronger throughout the day. These conditions are particularly hard on swimmers who start the race later in the day and so are more likely to cop the stronger currents. The forecast for the actual race day will be available next Wednesday and updated daily. Although, strong northward currents are common for this time of year, conditions could be quite different depending on the weather leading up to the race. Between the clouds we can see that coastal ocean temperatures are 1-2°C cooler than usual off Perth and have been for most of the summer. The cool temperatures can be put down to a weak Leeuwin Current this year and a fairly strong Capes Current. The Leeuwin Current brings warm water south throughout the year and is usually strongest in the winter months. The Capes Current is a wind-forced shelf current that occurs mainly in the summer. It can be seen in the 14 Feb SST (right) as a cold tongue stretching north from Cape Leeuwin and Cape Naturaliste. Given the cause of the cool temperatures it is likely they will persist until race day. Bluebottles, Upwelling and Tasman Sea Warming – that Blocking High is Back. Masses of bluebottles have been turning up on southern Queensland beaches over the last week with thousands of people being stung. Further south, upwelled water has been cooling beach temperatures along the northern and central NSW coast and in the Tasman Sea the water is warming. All of these events can be linked to the presence of a blocking high over the Tasman (Figure 1). A high-pressure cell becomes a blocking high when it stalls, staying in about the same place while the surrounding atmosphere moves around it. These highs can persist for several days to weeks causing the areas affected by them to have the same kind of weather for an extended period of time. The persistent winds, which blow anticlockwise (in the southern hemisphere) around the blocking high, are behind both Queensland’s stinger invasion and the cold upwelling off northern NSW. Bluebottles can be found in large armadas floating around the Pacific Ocean and with their buoyant sail float high in the water and go wherever the wind takes them. Off southeast Queensland the winds have been persistently onshore since Christmas bringing any bluebottles that are out there right in to the beach. Along the NSW coast the atmospheric high brought upwelling winds, from the north-east, giving the EAC an assist to lift cold waters from deep offshore to the coast. Sea surface temperatures from Lennox Head to Newcastle (Figure 2) have been particularly cold (off the scale) and well into the coldest decile SST for this time of year. Clear skies under a high pressure system also allow for a lot more solar heating so we expect sea surface temperatures to warm while the high is in place. 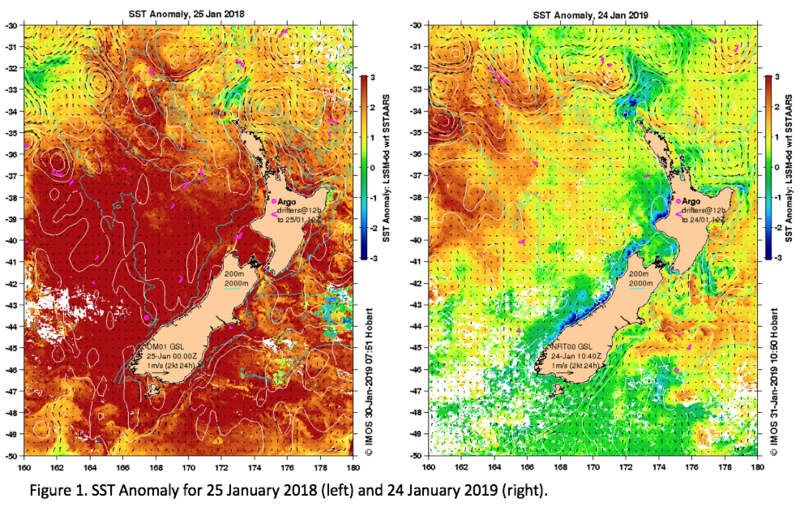 Temperatures in the Tasman Sea, particularly west of North Island, New Zealand, have increased by 3°C (Figure 1), and once again, waters off SE Australia are in the top decile of sea surface temperatures for this time of year. A similar blocking event occurred in November 2017, although the high was centred further south and west, causing upwelling on the south coast of NSW and ocean surface warming closer to Australia. The four-day outlook from the Bureau of Meteorology is for the high to be disrupted a little by a front on Sunday but then to re-establish itself again so there could be more of the same for a little longer. Sailors in the Sydney-Hobart yacht race almost always benefit from a few knots of favourable current at some point in the race. But where this happens is different every year, and the amount of favourable current experienced by a yacht sometimes depends a lot on the exact track it takes. 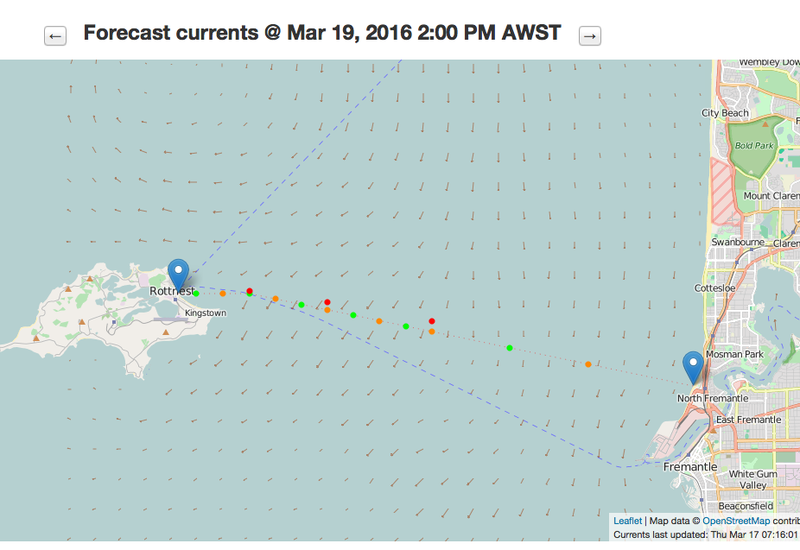 On present indications, there is little prospect of yachts finding favourable currents anywhere north of Ulladulla. This is because a cold-core eddy is presently off Jervis Bay, so there is an adverse current on the western side of the eddy where the yachts will be wanting to go. This eddy is not particularly large or intense, but it will probably persist until race time (it was much stronger a month ago when it was off Sydney). South of Ulladulla is where yachts may find strong favourable currents this year. 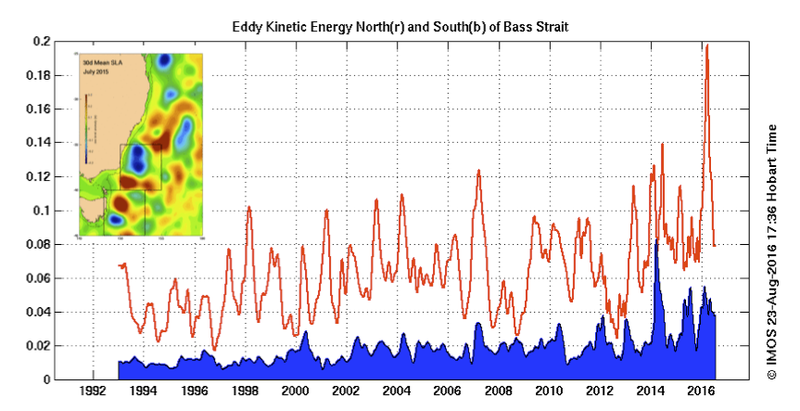 This is the case in about 70% of years, when a warm-core eddy is off the southern NSW shelf. This year's eddy does not extend very far south, but there is another warm-core eddy farther south, east of Bass Strait. There does not appear to be any strong features off Tasmania this year, but this could change, so keep an eye on the imagery. We wish competitors a safe but exciting race, and urge all to monitor the imagery that will appear on our website, including our new '4 hour SST' products derived from Japan's geostationary satellite Himawari-8. How did Ella's message in a bottle get to Queensland from Tasmania? Oceanographic wisdom is that waters off eastern Tasmania are either south-bound in the ‘Tasman leakage’ of East Australian Current waters into the Great Australian Bight, or east-bound in the ‘west wind drift’ of the Sub-tropical Convergence Zone. What do we make, then, of news that a bottle dropped 12nm east of Bicheno, Tasmania, in November 2016 was found almost 2 years later in Shoalwater Bay, Queensland, in September 2018? To investigate the likelihood of this trip, we used the same modelling system that we have used on many occasions for simulating or forecasting the long-term drift of items floating on the sea surface (e.g. missing flight MH370). This system uses global numerical models of the ocean and atmosphere, each of which relies on a global network of observing systems to be as accurate as possible. Items floating at the surface get an additional boost from the waves; not so much the swell, but the very short period waves of 1-4s, which travel in the direction of the wind. This effect is called Stokes Drift and is about 1.2% of the wind velocity. For anything floating above the surface, wind drag, or windage, also becomes important but we can assume it to be negligible for a bottle. We tracked 200 ‘virtual bottles’ dropped in our virtual ocean on 20 Nov 2016 – thought to be the day the family were on their fishing trip. We started the virtual bottles in a tight ring (about the size of the model grid, which is 10km) around the real bottle, so they would all be equally representative of it. The turbulence in the virtual ocean quickly separated the virtual bottles, faster and faster as the distances between bottles increased. This is much the same as would happen if 200 real bottles were dropped at the one spot. Most of the virtual bottles headed for New Zealand, the first making landfall on 22 Sep 2017. This is what we would expect to happen to most of the real bottles if a large number were released. But a small proportion of the virtual bottles did make it to Queensland - some going quite far north. One actually ended up, of all places, in Shoalwater Bay on 7 July 2018 (just a couple of months earlier than the real bottle was located)! Click the image at right to see an animation of the chaotic trajectories of the virtual bottles. The background colour indicates the magnitude of the surface velocity, highlighting the slow-moving eddies. The effect of passing storms (white vectors indicate the wind) on the bottles is evident. Virtual bottles do loops around these eddies, first one, then another, as we know real satellite-tracked drifting buoys do. Occurring randomly with respect to eddy centres, wind or small-scale turbulence nudge each bottle (similarly for real or virtual bottles) in or out of an eddy if the bottle is close to a critical streamline. So, on the face of it, this experiment is consistent with both the existing body of knowledge and an observation that seemingly conflicts with that body of knowledge. Is there a paradox? Of course not. When we study the world’s ocean currents, the focus is on where most of the water goes, not every molecule. Our simulation showed that going to New Zealand was the most likely, but certainly not the only possible, destination of the bottle. We can’t really say if the likelihood of going to Queensland was more or less than 1%. But one thing is clear: the trip of that bottle was extraordinary. Sea level has risen, on average, 8cm over the last 25 years of satellite altimetry (see figure). It doesn’t seem that much - so what’s the fuss? Firstly, sea level has been rising since the industrial revolution. It is estimated to have risen a total of 25cm since 1880 and already the effect is being felt in the more low lying Pacific islands. The Solomon Islands has lost 5 islands to coastal erosion and Kiribati’s fresh water supply below the atolls has been contaminated with salt water. Secondly, the rate of rise is increasing. The 8cm rise in the last 25 years happened twice as fast as the 17cm rise that occurred over the 110 years beforehand. More concerning, however, is that the rate of sea level rise appears to have increased since 2010. The trend, or average rise, through 1993-2010 is much smaller (2.62 cm/decade) than the trend for the full time series (3.22 cm/decade) as shown in Figure 1. It is tempting to estimate the trend for the 8 years since 2010 but the large ENSO signal throughout these years makes it difficult to get an accurate estimate. Observations of ice loss, however, give reason to believe the apparent increasing rate of sea level rise is real. Thermal expansion and glacial ice melt have been the biggest contributors to sea level rise since 1993 but the amount of ice lost from Greenland and Antarctica is increasing every year. Greenland is melting faster than anticipated due to algal blooms in the snow, which darken the ice, allowing more solar energy to be absorbed. The West Antarctic ice sheet started to melt much more rapidly after about 2006 and is susceptible to rapid and complete loss because the land mass below the ice is below sea level. The response of the earth to the mass change due to ice melt is complex. When the weight of ice is removed the earth’s crust rebounds quickly but there is also a slower rebound in the mantle below. There is some hope that the mantle rebound below Antarctica may be rapid enough to mitigate the collapse of the West Antarctic ice sheet which otherwise would contribute 3m to sea level rise. Of course, this hope also relies on the world taking real action on CO2 emissions, which we are yet to see. Monitoring our changing earth has become critical and satellite altimeters and gravimetric missions provide us with unprecedented observations and understanding of sea level rise around the globe. These satellite observations rely on ground truthing. One of the three calibration and validation (Cal/Val) sites globally which help maintain the accuracy of the observations is located near Burnie in Bass Strait, run by the University of Tasmania’s Christopher Watson and CSIRO’s Benoit Legresy. Their work forms a part of the global effort to ensure we have accurate knowledge of what is happening on our planet. Watson, C. S., N. J. White, J. A. Church, M. A. King, R. J. Burgette and B. Legresy, 2015. Unabated global mean sea-level rise over the satellite altimeter era. Nature Climate Change, 5, 565-568. An Argo float (WMO # 5902378; deployed in 2014) that drifted near the continental shelf off central New South Wales on 12 August 2018, showed cold and slightly fresh waters below 200 m depth – but nothing remarkable. By 22 August, the same float returned an interesting little “spike” in potential temperature and salinity at about 500 m depth. This spike was isolated to a few tens of metres, relatively small in amplitude, but quite distinct and eye-catching. 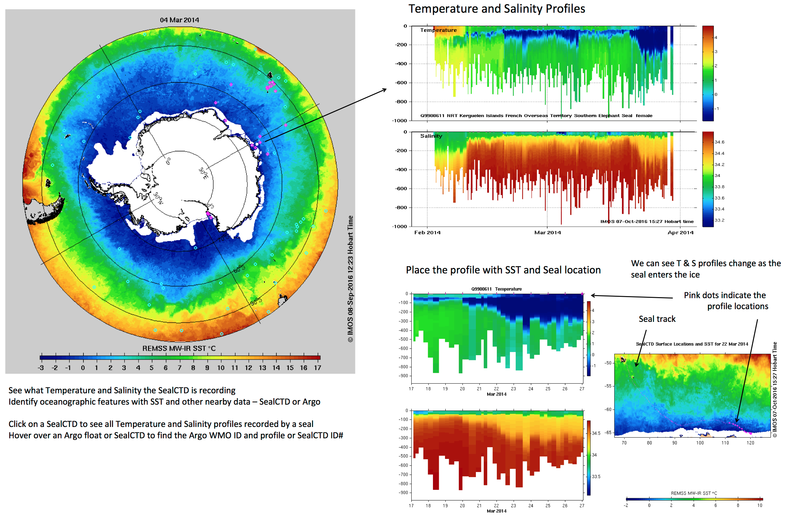 The next profile by the same float (measured on Monday 1 September), performed after the float had drifted offshore, shows a massive anomaly of temperature and salinity between 450 and 750 m depth, with waters about 3 degrees and 0.8 psu above normal (Figure 1). Analysis of the TS properties of these profiles (Figure 2) shows that the most recent profile has the signature of cooled Bass Strait Water. First observations of the Bass Strait winter cascade were made by Boland (1971) but more recently glider observations indicated high oxygen content in the water mass, confirming it to have had recent contact with the surface, Baird and Ridgway (2012). Where did this water come from? OceanCurrent Gridded Sea-Level Anomaly (GSLA) maps shows that over the continental shelf off southern and central NSW there‘s been persistent northward currents for most of August 2018. The presence of northward shelf currents, evident in the GSLA, was confirmed by a northward drifting surface drifting buoy. This is also reflected in SST with colder than normal waters adjacent to the coast. 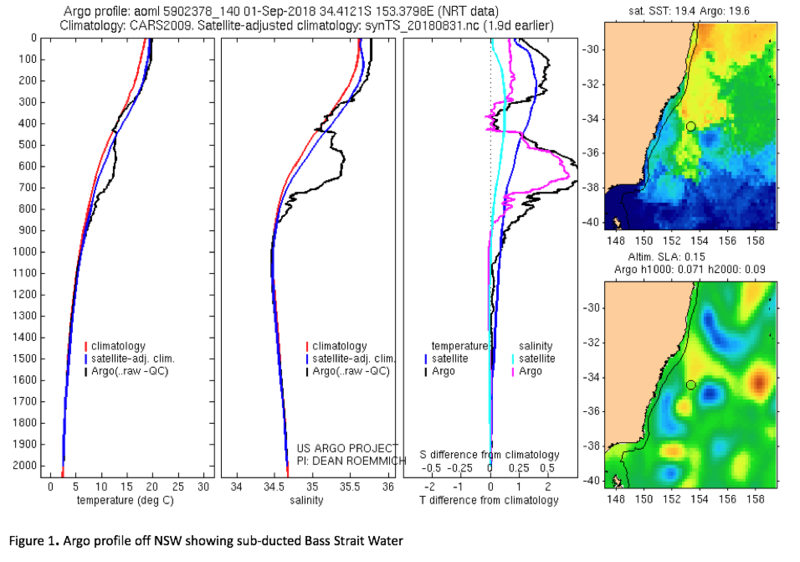 It appears that water originating in Bass Strait, with salinity of 35.4 psu, has cooled over winter, left Bass Strait flowing into the Tasman Sea, and drifted northwards along the NSW coast before becoming entrained into a passing eddy at ~600 m depth. What will happen next? 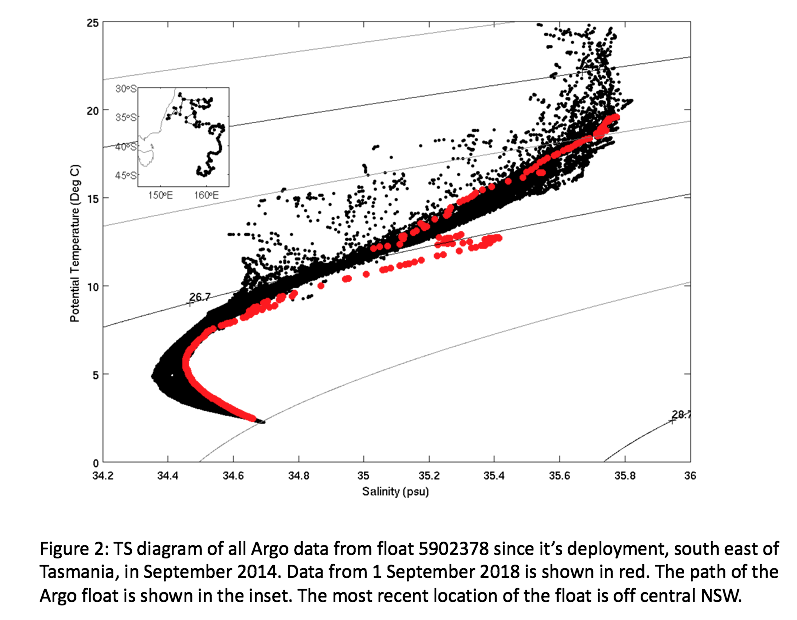 Standard Argo floats are programmed to park at a depth of 1000m for 10 days between profiles which is almost 300m below the depth of the Bass Strait water recently sampled so it’s drift velocity may differ from the Bass Strait water’s velocity. We’ll have to watch this Argo float #5902378 to see if it samples the Bass Strait water again. The next profile is due to be available on 11 September 2018. 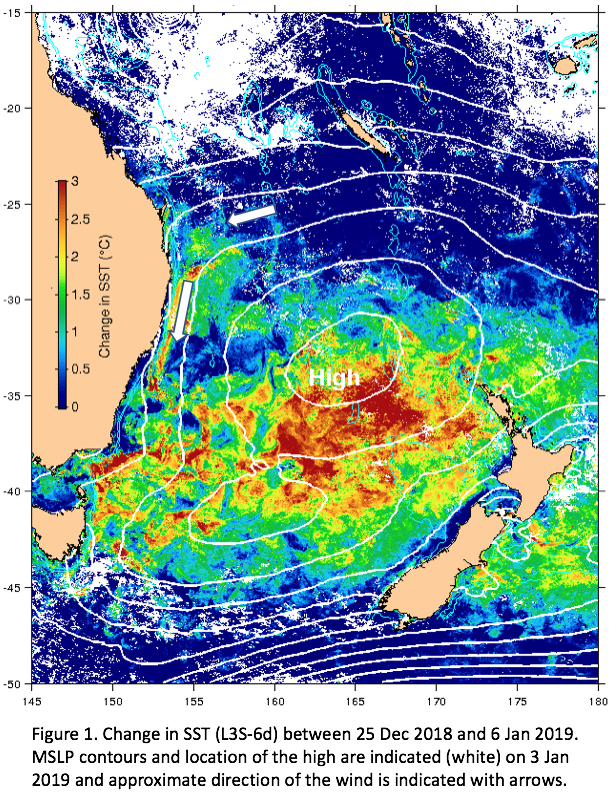 Baird, M. E., and K. R. Ridgway (2012), The southward transport of sub‐mesoscale lenses of Bass Strait Water in the centre of anti‐cyclonic mesoscale eddies, Geophys. Res. Lett., 39, L02603, doi:10.1029/2011GL050643. Boland, F. M. (1971), Temperature‐salinity anomalies at depths between 200 m and 800 m in the Tasman Sea, Aust. J. Mar. Freshwater Res., 22, 55–62. Our new Four-hour SST product is now available on OceanCurrent. It uses Himawari-8 SST images (and all other available SST) to provide 6 images per day. Four-hour SST, as its name implies, provides an image every 4 hours using all 10-minute data within a 4-hr time-window. There is also a parallel product called Filled-SST where the cloud gaps are filled with the latest previous SST. We have included the average wind speed (courtesy of the Bureau of Meteorology) as well, in order to help identify low-wind regions where the SST only represents a thin, extra-warm layer at the surface. The image right demonstrates such a phenomenon, often called the afternoon effect because it is usually maximum in the late afternoon. Note the time of the image at 0800 UTC is 4pm AWST. We have timed the Four-hour SST to catch peak afternoon effect (0600 UTC on the east coast) because it can impact near-surface corals. Although the heating is unlikely to cause any problems in winter, it is interesting to see the cooler outline of Scott Reef (at approx. 122E and 14S) most likely due to the effect of tides. a conservative estimate of the SST percentiles by referencing the image to the statistics of SSTAARS. These statistics are for 1-day night-only averages, so our percentiles are slightly skewed towards the median. Ocean fronts, defined as regions of large horizontal gradients in water properties (temperature, salinity etc), are areas of high productivity globally. Recent satellite imagery from the north-west shelf indicates the existence of two types of fronts extending over 1000km from North-West Cape to Cape Leveque. 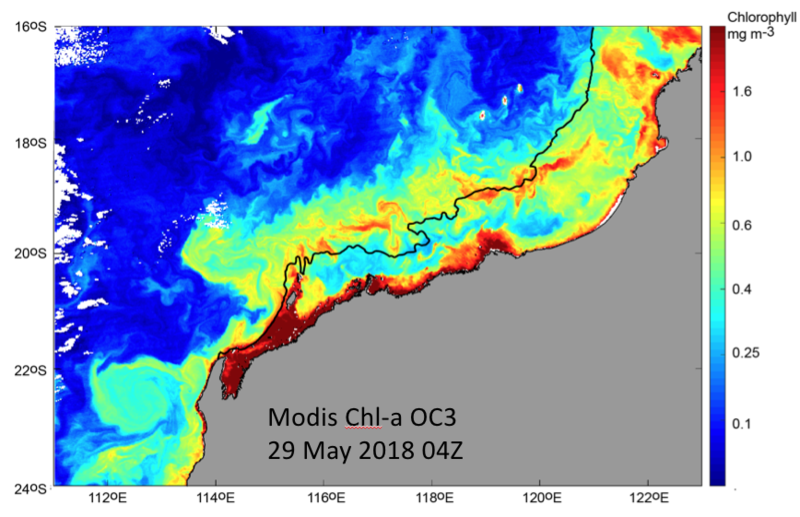 The nearshore band of high chlorophyl is associated with a very cold band of water at the coast that usually develops every May, persists throughout winter, and is evident in the SSTAARS climatology. Water in shallow coastal regions become more saline over summer due to evaporation and with winter cooling the water becomes much denser than water further offshore. This cool, dense water then flows offshore along the bottom as a dense shelf water cascade which has been observed by ocean glider deployments in the region and other regions of Australia. On continental shelves, fronts can also develop just through the reduction of tidal currents with depth without the influx of different water masses. 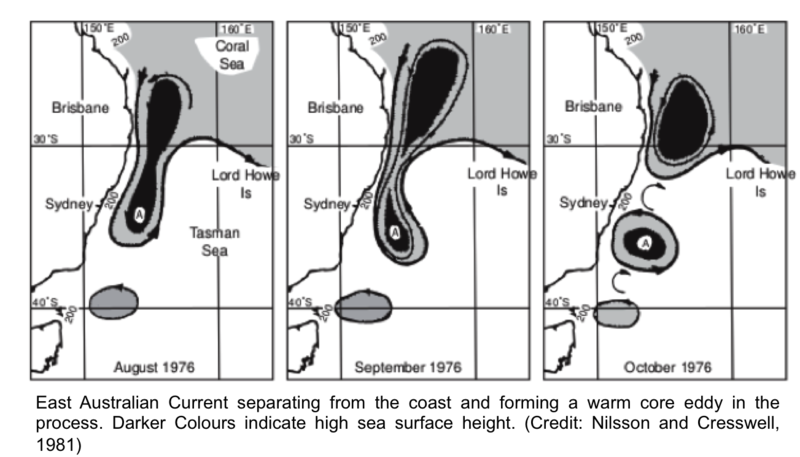 Simpson and Hunter (1974)¹ showed that a front could develop where mixing due to tidal currents was no longer strong enough to overcome stratification. Many studies undertaken globally have shown that the ratio of the water depth to nearbed current speed cubed, h/|U³| is a good indicator of the location of tidal fronts, in particular where log10 (h/|U³|) = 2.7. The band of higher chlorophyll found further offshore, suggesting the presence of a second front, lies in close proximity to the predicted Simpson and Hunter tidal front location (indicated with black line). Coastal currents transporting different water masses can also contribute to the existence of fronts and the frontal location could also be related to the location of the Holloway current that flows towards the south-west. The offshore chlorophyll maximum, although much weaker than in the nearshore front, has affected about 1000km of the mid-shelf region. Recent work by Thums et al. (2017)² demostrated that flatback turtles (Natator depressus) followed the location of the predicted Simpson and Hunter tidal front when migrating along the Kimberley Coast. ¹Simpson, J. H., and Hunter, J. R. (1974). Fronts in the Irish Sea. Nature 250, 404–6. ²Thums M, Waayers D, Zhi H, Pattiaratchi CB, Bernus J & Meekan MG. 2017. Environmental predictors of foraging and transit behaviour in flatback turtles (Natator depressus). Endangered Species Research, 32, 333–349. STC Marcus was the strongest tropical cyclone anywhere within the Australian region since STC Monica in April 2006 according to the BoM. It struck Darwin at only category 2 intensity, causing widespread damage, but went on to reach category 5 on 22 March 2018 well away from land. This MODIS ocean colour image (click to expand) shows that Marcus left a distinct trail in the ocean as it tracked west near latitude 15S and turned south near longitude 108E. 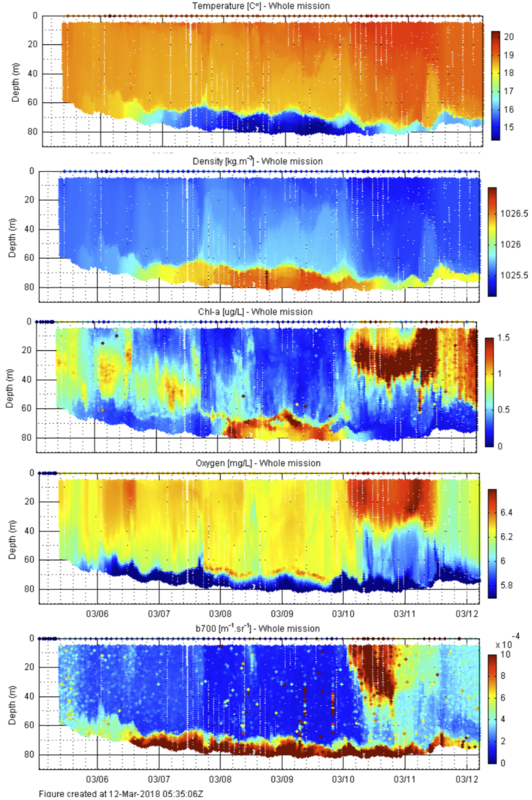 It appears that the winds (estimated to have reached 325km/h) and waves caused a lot of vertical mixing, bringing nutrients and the deep layer of phytoplankton up to the surface. Apart from coastal storm surge and a slight reduction of sea surface temperature along the path of the cyclone, however, other ocean impacts are not obvious. Weaker, but slower-moving cyclones have had more impact on the ocean. The IMOS Ocean Glider Facility has launched the third annual glider across Bass Strait. 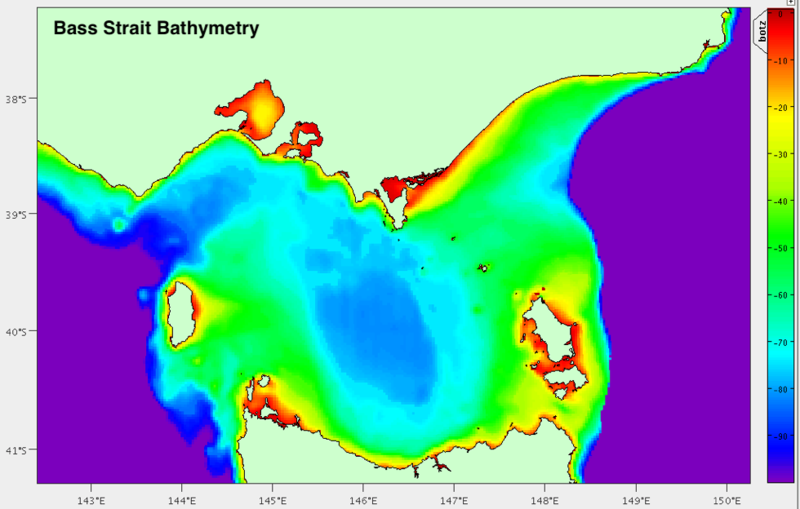 It has just completed the transect, and the presence of a dense cold pool in the deepest part of Bass Strait is evident. The centre of Bass Strait (right) is deeper than its surrounds and would have formed a large fresh-water lake when Bass Strait was exposed 15,000+ years ago. Nowadays the deepest part of Bass Strait is 80 m deep with the deepest outlet to the north at 70 m. Thus the ancient lake continues to act as a place where water can collect – in this case, dense Bass Strait water. During winter, strong winds and surface cooling create a well-mixed dense water mass in Bass Strait that gradually becomes denser than water of the Tasman Sea to the east because the cooling is confined to the depth of the strait. Once the density difference becomes large enough in the winter, the cold dense pool exits Bass Strait as a bottom density current at the north-eastern side. This year, the Bass Strait glider has traversed the lake and found a cold, dense pool of water which is low in oxygen, most likely a remnant of last winter. This bottom layer at 70-80 m was the portion of Bass Strait water that could not exit last winter because of the 70 m deep ridge across the eastern edge of Bass Strait. High chlorophyll-a indicates a bloom has occurred in the deep water where both nutrients and some light are present. The oxygen maximum just above the interface shows the bloom is growing. But once winter comes, they will be mixed to the surface and then flow northward out of Bass Strait. Only the unlucky ones will get trapped for another summer - perhaps to be seen by the fourth Bass Strait glider. Update: The forecast currents are still expected to be northward but weaker than originally forecast. The wave forecast from the Bureau is still predicting a challenging wave field of 1.5-2m waves from the southwest throughout the day. Original Forecast: With moderate to strong southerly winds forecast by the Bureau of Meteorology and waves of 1.5-2m from the southwest, this years Port to Pub swim will be more challenging than the Rottnest Island swim last month. 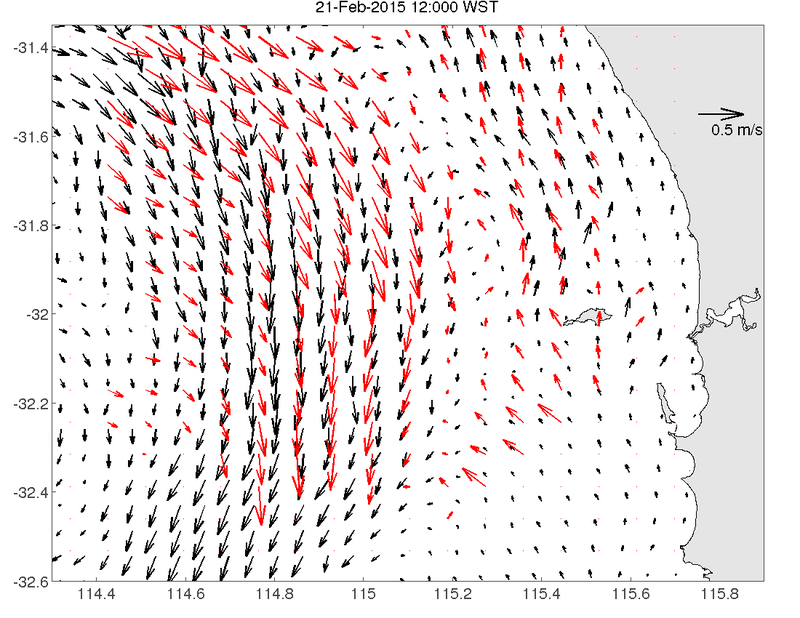 The ocean forecast from the University of Western Australia for Saturday is predicting currents of 1 knot from the south throughout the day from the halfway mark out to Rotto. Near the coast, the currents will remain weak until late in the day so the 5km swim up to Cottesloe and back should not be affected by the currents but the waves could be quite challenging on the southward leg. Of course, the forecast may change over the next few days so check again on Friday for the last update! The HF RADAR system installed off Newcastle late last year is now working well, as demonstrated by this map for 3 March 2018, in which the radar currents are overlain on a Sea Surface Temperature image as well as geostrophic currents from altimetry. All three ocean observing systems reveal the main flow of the East Australian Current separating from the shelf and heading off towards New Zealand. Only the radar and the SST imagery, however, can resolve the details of the submesoscale eddies between the EAC and the continental shelf. The Rottnest Swim forecast is changing with the front coming through a little later. Before midday the currents will be northward but as the currents start to turn swimmers still in the water will get an assist that builds throughout the afternoon. Of course if the front ends up coming through much later there won't be any assist from the currents and the flow will be the usual northward flow, getting stronger near Rottnest Island. You can keep an eye on the ocean forecast with the swim optimizer. The Rottnest Swim Forecast Is In! The University of Western Australia has provided the ocean forecast for race day and things are looking complicated! For now, the forecast is for northward currents in the morning, changing to southward flow by early afternoon. This is easy to see with the swim optimiser and you can use the arrows on the optimiser to see the hourly forecast. The change in current direction is due to a change in the wind direction. In fact, this year's forecast is different to any other year because it's flipping between the two 'normal' summer regimes mid-race. Of course, that makes it more unstable because it's accuracy depends on the timing of the front. The meteorological forecast may change over the next few days and this will be updated every morning heading up to race day. 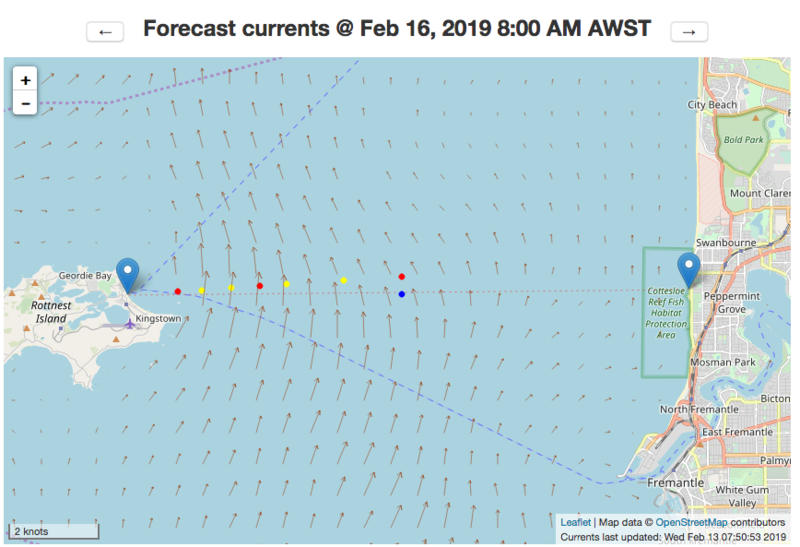 If the forecast does hold it could be a very fast race with the ocean currents giving swimmers a push towards Rottnest Island as the currents turn. We’ll be keeping a eye on the forecast and post an update if things change. Sea Surface Temperatures around Tasmania reached extremes this November but how deep did the heating go? Sea surface temperatures around Tasmania were above the 90th percentile for the last 10 days of November, particularly to the west and south. Temperatures were hottest off the northeast associated with a weak EAC eddy but more unusual were the high temperatures off the west coast (see right) that also peaked at over 18°C, which is more than 3-4°C above the November mean. The blocking high in the Tasman that directed northeasterly winds over Tasmania and brought a record 6 days of temperatures over 26°C also created the conditions for a week or more of cloudless skies. Cloud-free conditions allow maximum solar heating particularly at this time of year when UV radiation is reaching its peak. SST indicates that off the west coast temperatures increased by up to 4°C over 3 weeks. Satellite SST, however, is a measure of only a very thin surface layer (or surface skin) and when winds are very weak there is not much vertical mixing and the SST may only represent a shallow surface layer. Without modeling it is impossible to know how deep this surface layer extends. The unusual weather conditions meant that not only was the sky around Tasmania cloud-free but the west coast, in the lee of the wind, was almost becalmed as well (photo courtesy of Emlyn Jones, oceanographer and self-described fishing tragic). 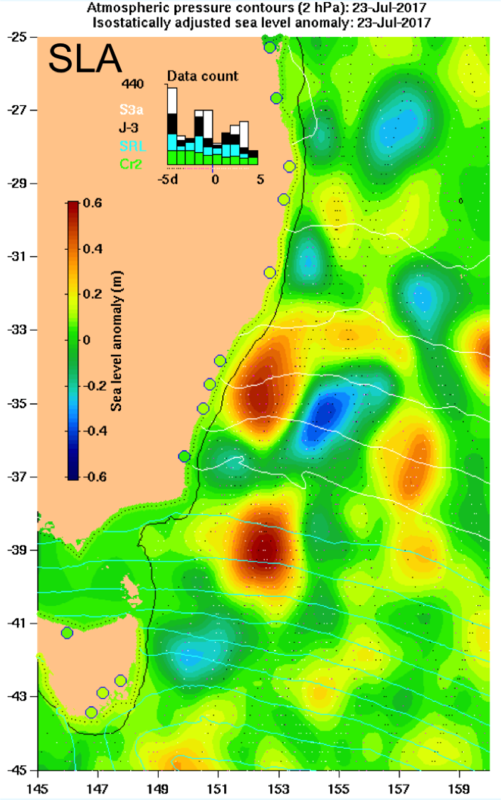 The ‘hot spot’ off the west coast suggests that in this region the heating may only be shallow. The consequence of shallow heating is not only that the extreme temperatures only affect animals and plants near the surface but also that the temperatures will be short-lived and quickly reversed with the next windy day. 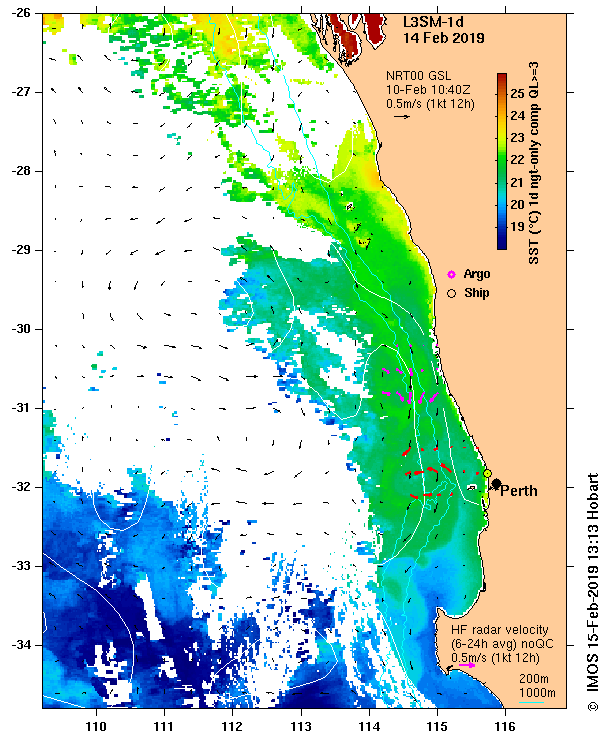 Argo floats can provide a window to what is happening beneath the surface and there happened to be one off the west coast shelf (pink circle on SST image) that profiled the water column every 10 days through November. The development of a warm mixed-layer throughout the month can be seen in the Argo temperature profiles. The closest satellite SST for each profile is also plotted to indicate any discrepancy between the surface and water below. In early November the water was well-mixed down to 60m and the Argo temperature at 5m was very close to the mixed layer temperature. 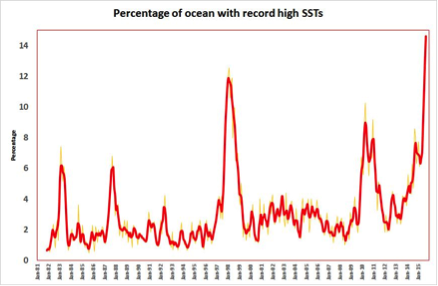 For all days the float profiled, the satellite SST was within 0.7°C of the temperature at 10m. After the weather changed the surface heat was mixed down to 40m reducing the surface temperature significantly but resulting in an increase of at least 2°C in the mixed layer since the beginning of November. Based on the SST anomalies, the west coast surface waters were 3-4°C above average for at least 10 days during November. From the Argo profile on Nov 24 it is clear the lack of wind was creating a shallow surface layer so at the peak of the event it is most likely the sub-surface temperatures would not have reached the 4°C anomaly but probably an anomaly of 3°C. In any case, with a 2° increase in temperature of the top 40m, the event created a strong injection of heat into surface waters around Tasmania. The system can be considered to have been primed so that a repeat period of cloudless conditions, in the near future, could build on the heat that has been stored. Unlike the west coast, water temperatures on the east coast, away from sheltered regions, were unaffected by the heating because the atypical north-easterly winds drove an upwelling event that kept the shelf waters cool despite the warm EAC water just offshore. We have an interesting situation this year, with an unusually strong, cyclonic (clockwise rotating, cold-core) eddy off north east Tasmania. This is quite likely to persist until race time, in which case yachts sailing through its western side (presently on the rhumbline) may encounter adverse currents of 1kt. If winds are light, this could be an important consideration. Conversely, favourable currents may be found on the eastern side of the eddy – but that would require quite an extensive detour off the rhumbline. It might be possible to avoid the adverse current by sailing very close to land but that is difficult to assess, let alone foretell this far in advance. 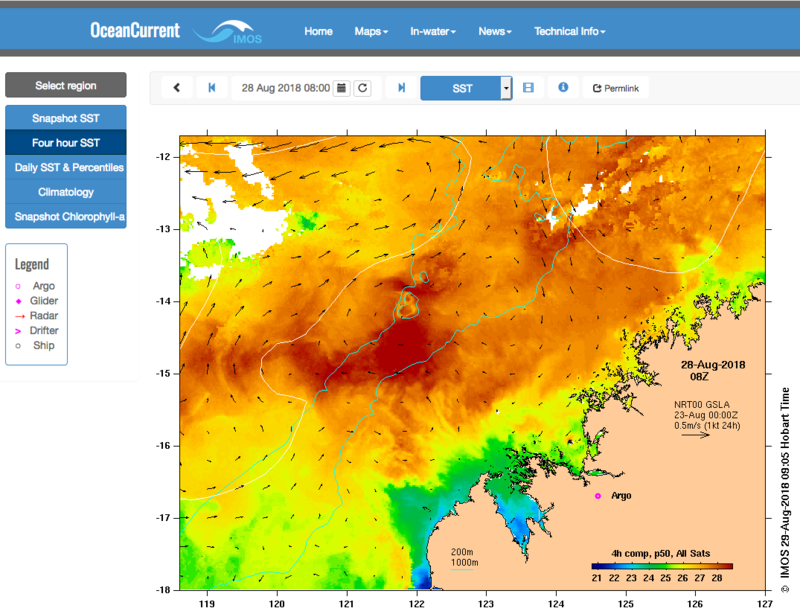 Currents off NSW are more typical. There is presently a large warm core eddy off southern NSW, causing strong favourable currents along the continental margin (i.e. beyond the 200m isobath). This eddy will probably slowly migrate south between now and race-time. We wish competitors a safe but exciting race, and cross fingers that we suffer no power outage – the usual culprit that stops our website updating unattended while we are all on leave. Look out for an update closer to race day. Upwelled water has cooled the beaches along the coast of NSW from Coffs Harbour to southeastern Victoria for more than two weeks. Beach water temperatures from Coffs to Jervis Bay have been disappointingly cool at 16-17C but it’s been really cold (12-13C) on the southeast corner around Eden and East Gippsland. What is unusual about this event, however, is not so much the cold but how long it has lasted and how much of the coastline it affected. And it looks like we can blame the same blocking high in the Tasman Sea that brought record-breaking air temperatures in Tasmania and parts of Victoria with a healthy contribution from the East Australian Current (EAC). Upwelling is a coastal response to an alongshore wind and off the NSW coast an upwelling favourable wind is from the northeast. However, northeasterly winds in this region are relatively weak and short lived so upwelling events often only occur when the EAC gives the wind an assist by lifting the cold deep water closer to the surface. Throughout November, the EAC was close to the coast and a huge warm core eddy was sitting offshore between Sydney and Jervis Bay but there wasn’t any upwelling until the blocking high established itself in mid-November in the Tasman Sea. Winds around this blocking high, brought upwelling favourable winds to the entire southern NSW coast, strongest in the southeast corner and through Bass Strait. Although a blocking high in the Tasman is not at all unusual, it is unusual for one to stay for more than a week. This high stayed for two weeks and in that time winds were persistently from the northeast quadrant all along the southern NSW coast, decreasing northward. 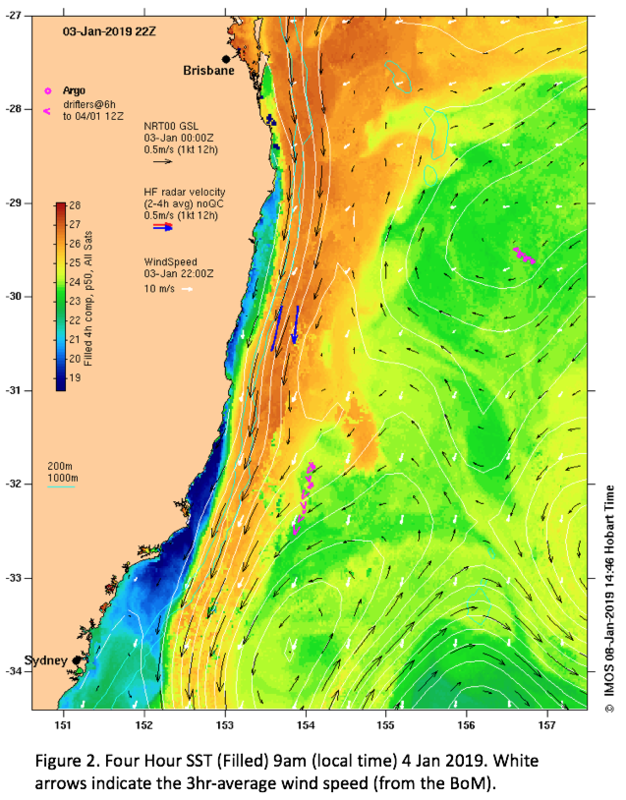 At the same time the EAC/eddy influence which was mostly from Jervis Bay northward created conditions so that even weakly upwelling winds would bring cool water to the surface. Along with the cold water, upwelling brings nutrients up to the surface where the phytoplankton can use it and grow. Ocean colour images indicate high chlorophyll-a concentration in the upwelled water. Near the coast, river runoff can contaminate the reading but in this case the colour is clearly associated with upwelling and indicates a strong phytoplankton response along much of the coastline. For a rich ecosystem, a persistent upwelling event is more important than a strong one as it allows the zooplankton time to respond to the phytoplankton growth and in turn provide food for the next step in the food chain. The blocking high looks like it is moving on now but not before a burst of upwelling favourable winds from Eden to Coffs in the first few days of December resulting in yet another cold pulse in beach temperatures! Himawari-8 is Japan’s advanced geostationary weather satellite that provides a ‘full disc’ scan of Earth every 10 minutes. Fortunately for us, the centre of this view (at longitude 140.7°) is close to us. The result is an SST product spanning 80°E to 200°E with a resolution (2-4 km at the equator) that is nearly as good as the low-earth orbit NOAA satellites. Cloud is, of course, the bane of observers of satellite SST and Himawari-8 cannot see through cloud, but with so many looks there is a much better chance to piece together a clear view. OceanCurrent has developed 4-hour composite SST* based on the Bureau of Meteorology’s experimental Himawari-8 product. The first images are very promising - the animated gif (right) of 48 hours of the 4 hour composites offshore from Perth shows tiny eddies, about 10km in diameter, being swirled around the large cyclonic eddy in the centre of the image. There are also a couple of tiny eddies just to the southeast of the central eddy. Eddies of this size have certainly been seen before but the presence of so many suggests they are much more prevalent than we thought and that they play an important part in mixing between two water masses. Also, the movement of these tiny eddies demonstrates not just the complexity of the SST but also of the surface velocity field. Note, the black vectors indicate the geostrophic surface velocity and the white vectors indicate wind direction. See also: the Bureau’s viewer and information page. * All available satellite SST (including NOAA15, NOAA18, NOAA19, VIIRS and MODIS) is used in the composites to get the best coverage to the coast. Jason-2 begins a new phase: The king is dead, long live the king! Jason-2 has entered its End-of-Life phase – the Long Repeat Orbit (LRO) – having provided over 8 years of almost uninterrupted service since its launch in June 2008 until October 2016, when Jason-3 was ready to take over the exact-repeat orbit. 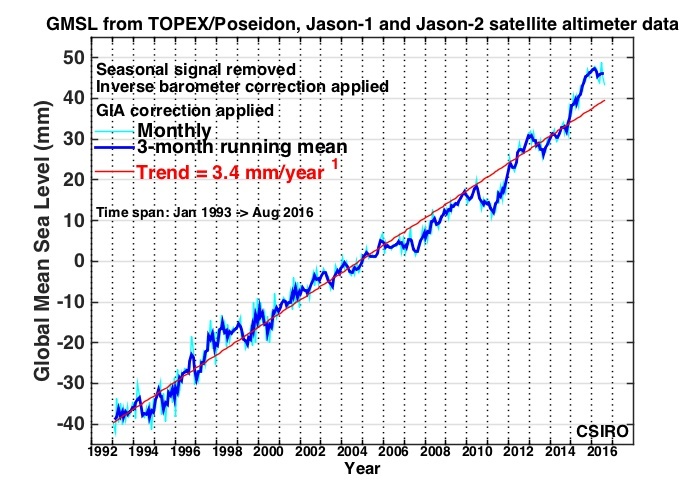 Jason-2 and Jason-3 are part of the Ocean Surface Topography Mission (OSTM) that began when Topex/Poseidon was launched in September 1992 and completely changed our knowledge and understanding of ocean variability. Ocean sea level height from satellite altimeters is now an essential variable, routinely assimilated into global ocean models and wave models. Sea level anomaly (SLA) from satellite altimetry (tracks are indicated on the SLA) also provides the basis for knowing the geostrophic ocean surface currents shown in OceanCurrent. Importantly, the 10 day exact-repeat orbit of the OSTM provides the backbone for certainty in our estimates of sea level rise. 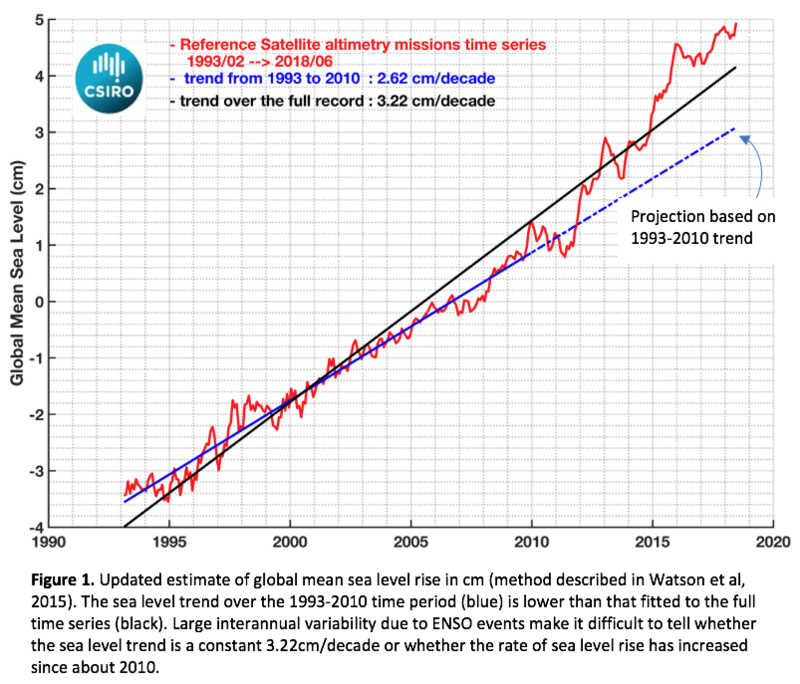 In maintaining the same orbit with a succession of altimeters then all altimeter measurements can be referenced to the same level resulting in a 25 year record of global sea level (above). Also, by repetition, the geoid, and therefore the mean sea surface, can be more accurately defined making the observations more precise. The handover between missions, however, is an important part of our confidence and it relies on a short period of time when the two satellites follow the same orbit. So far NASA and CNES have jointly managed to maintain an incredible 25 unbroken years but this time it got a little close. Jason-2 was put into an interleaving orbit once Jason-3 was established and managed to last another 6 months before one of the gyroscopes that help maintain the satellite orbit and pointing started to fail and steering became occasionally problematic. It has now been nudged 27 km lower than its original altitude of 1,336 km so that should it fail it won’t interfere with its successor. It has been put into a 17 day almost-repeat orbit ensuring high quality global mesoscale coverage every 17 days but it will not be repeating the same track each cycle. Now that Jason-2 has handed the reference orbit baton to Jason-3 it can provide data in new regions of the ocean, in between the reference tracks, to improve and fill the gaps of bathymetry and mean sea surface. The longer it spends in this new orbit the more improvement it will bring to geophysical applications while still fulfilling the operational oceanography needs. We recently added the tracks of our well-equipped seals to our archive of high-res satellite imagery (chlorophyll, SST and surface current). A 2014 trip by a male New Zealand Fur Seal from Montague Island to Jervis Bay – the long way - is particularly intriguing. The image at right shows the final 2 days of his trip around a warm-core, low surface chlorophyll eddy of the East Australian Current. His voyage started on 8 September and if you step through the images it’s hard not to think he has the imagery in front of him, or that he is laying on his back and just drifting with the current, occasionally diving down to 100m to check the stratification. Is the edge of the eddy better fishing? Does he like the warm water? Can he sense his drift velocity? Do seals talk all day about ocean currents, fishing, or both? It has been over a month since the tropical leatherjacket species started washing up on the beaches of far-eastern Victoria. 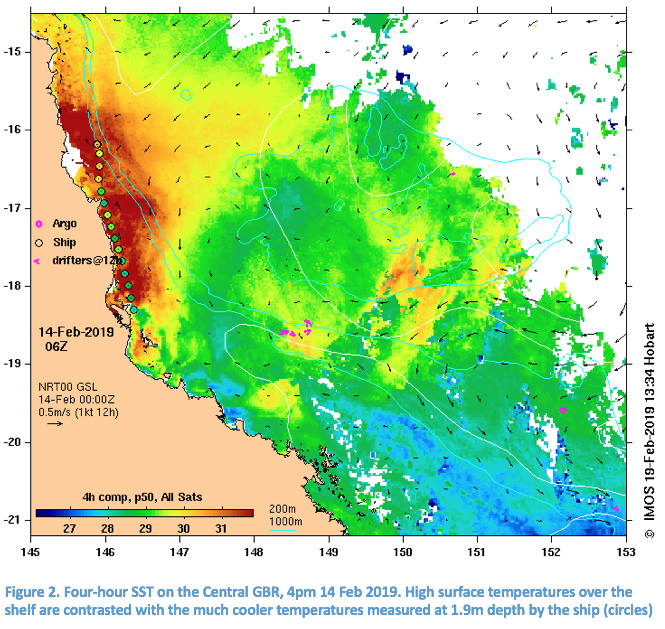 Fisheries Victoria concluded that the event was most likely due to the extreme temperature change associated with the upwelling event off East Gippsland. Fishers reported a sharp ‘temperature break’ with 25° clear water alongside 16°C cloudy water, evidence of which could be seen from the air on March 31. Since then there have been reports of leatherjackets washing up in large numbers on Tasmanian beaches all along the eastern coastline, most recently as far south as Fortescue Bay. The fish are often observed to be alive but struggling. There have been no strong upwelling events off Tasmania to cause the same dramatic temperature front as seen off Victoria. Indeed, surface temperatures off eastern Tasmania are close to median (50th percentile) values. However, since this species is most commonly found off northern Australia and less frequently along the NSW coastline, Fisheries Tasmania has concluded that they have simply reached the extent of their temperature range and are dying when they encounter the cooler southern waters. The last event like this in Tasmania happened in 2014 when the East Australian Current had extended unusually far south bringing with it a number of tropical species. This year John McGiveron from the Tasmanian Game Fishing Association says fishers have seen a lot of dead fish floating offshore and that a lot of them are found in the stomachs of bluefin tuna. Events like this have been more common previously off NSW but if the EAC continues its push south we will probably see more of them on Tasmanian beaches. Apparently, though, even last weekend there were still a lot of leatherjackets that hadn’t yet succumbed to the cold. CSIRO oceanographer, Alistair Hobday, reported seeing large schools of leatherjackets swimming in waters off the Tasman Peninsula. Mass Fish Die-Off at Mallacoota: Upwelling and the EAC? Thousands of dead fish have been washing up on the shores of far eastern Victoria and southern NSW. They started appearing on the beach in small numbers around March 11 but came in en masse in the last few weeks of March. Although most of the fish appear to be leatherjackets, there are also whiting, black sole, puffer fish, boxfish, sea urchins, flathead and even some penguins. Locals noticed the die-off coincided with a drop in ocean surface water temperature of 7°C and a lot of algae (described as a browny-green sludge) in the ocean. These observations are consistent with the satellite imagery. Cold upwelled water is evident from Mar 8 and persists for the rest of the month. SST images, Mar 12 & Mar 25, indicate the upwelled water extended for 50 – 100km along the coast and across Bass Strait. These images also show the water offshore is a warm 22°C and at times is separated by only 25km from the 14°C upwelled water. The Modis Chl-a image for March 14 shows an intense algal bloom associated with the upwelled water extending for almost 200km along the Victorian coast that persists throughout the month. The northeastern corner of Bass Strait is a well-known upwelling region and, as for the NSW coast, the two drivers for bringing cold, nutrient rich waters to the ocean surface are wind forcing and dynamic uplift created when EAC currents encroach on the continental slope*. This March these two drivers seem to have combined for maximum effect. 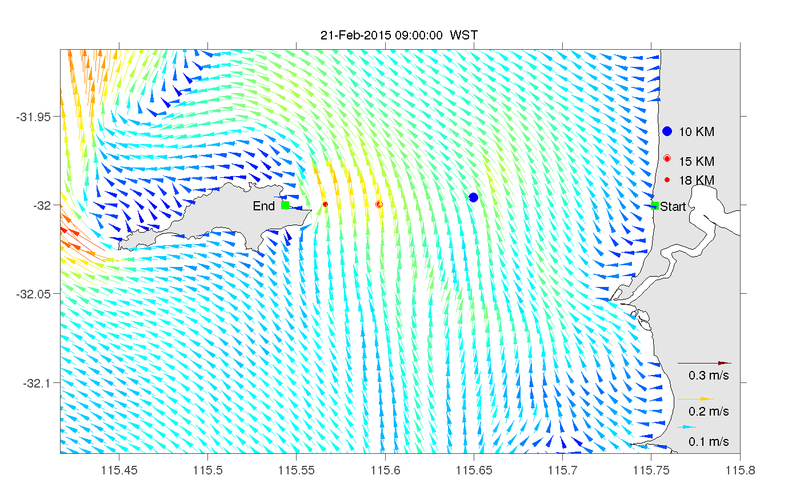 Winds were persistently upwelling favorable for the far eastern Victorian coastline and a large EAC eddy sat just offshore for most of the month (Mar 12). SST percentiles (Mar 12) show the upwelled water was within the coldest 10% of temperatures observed in March for that region while the EAC waters just offshore were in the top 10% of temperatures. Colder upwelled water implies a higher nutrient concentration as it is likely to have come from deeper in the water column. Warm EAC water on the other hand, though depleted in nutrients, allows for rapid phytoplankton growth, so there may be increased algal growth where the two water masses meet. The cause of the fish deaths is still to be established but could include hypoxia caused through oxygen depletion when the algae die off or suffocation due to the algae blocking the fish gills or even shock due to the rapid change in temperature. The Victorian EPA is investigating the event to determine the exact cause of the deaths and the various factors could be complex. 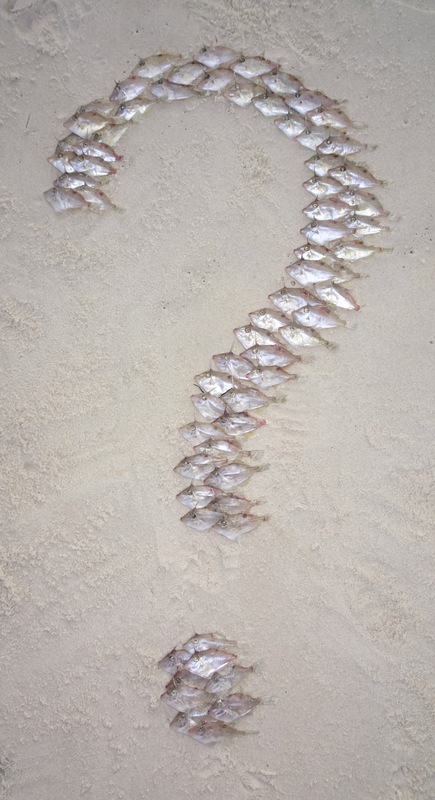 Whatever the cause of this fish kill it appears that increased southward extension of the EAC that has become apparent since at least 2014 has contributed to creating both a stronger upwelling event and higher gradients in temperature. The ocean forecast for the Port-to-Pub swim remains for strong northward flow on Saturday, persisting throughout the day. This strong cross current will increase the swim times for all swimmers by about 15 minutes for the fastest to up to an hour for the slower swimmers. In order to stay close to the buoys but not get swept north of Rottnest we advise heading almost westward at the start and then gradually increasing your southward heading as you approach Rottnest Island and the current becomes stronger. Your best heading will depend on your swimming speed and the swim-optimizer can help you with that. The good news is that the Bureau of Meteorology is forecasting weak winds from the east so the sea chop should not affect your swim time. Of course, our advice is based on forecasts which may turn out to be different on the day so all swimmers are advised to adjust their plan to the conditions on the day. Good luck to all swimmers from the OceanCurrent team! The ocean forecast for the Port-to-Pub swim on Saturday is for strong and persistent northward currents, weakly northward near Freemantle but ramping up to almost 1kn about half way through the crossing. There is also predicted to be a slight shoreward push in the currents, which will make the swim take that little bit longer. It’s early days yet though and the swim-optimizer will be updated every morning with forecasts from the Oceans Institute of University of Western Australia with the final forecast coming out on Friday. Note, we do not factor in the 5 km loop for the ultra-marathoners but you can still use the optimizer for the channel crossing. 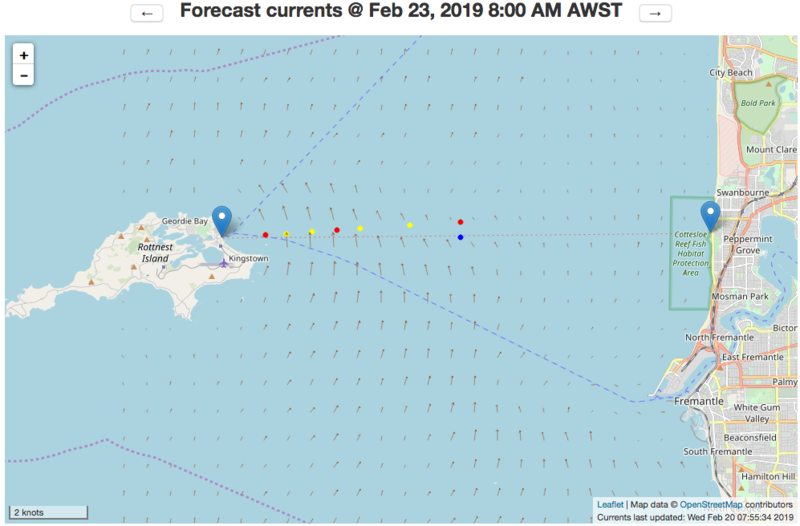 The forecast for the Rottnest swim this Saturday is for southward currents getting stronger throughout the day, particularly near Rottnest Island. So at this point, our advice is to stay close to the northern buoys, throughout the race, particularly those swimmers who will still be in the water after 11am. Winds are expected to be light and from the north-east. You can optimise your swim time based on the ocean current predictions by the Oceans Institute of the University of Western Australia. The ocean forecast depends on the weather forecast, which may change. Our last update is Friday morning. Today's weather briefing for the Rolex Sydney Hobart yacht race foreshadowed a quick race with northerly winds at first then a southerly when the fleet are in southern NSW waters. Ocean currents (on present indications) are also favourable for a quick race, especially at first, when a tail current associated with a large anti-clockwise (warm-core) eddy off Sydney will add a few knots to the fleet's speed over the ground. The challenge here will be deciding how far offshore it is best to go to optimize current as well as wind. The first image at right (click to expand) shows the cooler coastal temperatures that we often see under these conditions and associate with reduced southward speed. This eddy has been off Sydney since about 7 Dec and is quite likely to still be there on race day. The first image at right also shows a small clockwise eddy south of Jervis Bay. This will either grow in place or be swept southwards in coming days. In either case, it will mean that inshore and offshore yachts may experience very different currents off southern NSW while also dealing with the southerly wind change presently forecast. Currents east of Bass Strait do not appear to be particulary strong this year. The rhumbline (2nd image at right) presently cuts across a large but fairly weak clockwise eddy that is likely to persist until race day. As in past years, anyone wishing to overlay the yachts' positions on our maps of ocean currents can do this using Google Earth. We wish the competitors a safe but exciting race, and cross our fingers that our computers keep running unattended through our Christmas Shutdown. If our images stop updating, it probably means there has been a power interruption in Hobart. The IMOS Animal Tracking Facility has deployed over 250 SealCTDs (miniaturized CTD sensors with an ARGOS antenna) on Elephant Seals, Sea Lions, Fur Seals and Weddell Seals since 2009. The data can now be viewed on OceanCurrent. The original motive for the sensors was to provide information about animal behaviour but the physical data they have collected has already been valuable in studies of Antarctic bottom water formation, the global heat budget, Southern Ocean frontal structure and sea ice formation. Argo float and seals provide different styles of profiling. Argo floats (in standard configuration) transmit a 2000m deep profile, with high vertical resolution, every 10 days whereas the SealCTDs transmit a profile every 6 hours. Each CTD sensor records data from every dive but selects the ascent profile from the deepest dive over the last 6 hours. In order to prolong battery life and to ensure the whole profile is transmitted before the seal dives again, the profile is also compressed (by calculating break-points) before transmission. The SealCTD (or tag) is glued onto the animal's head and drops off during their moult. The temperature and salinity profiles (right) during a female Elephant Seal’s journey from Kerguelen Island demonstrate the high temporal and spatial resolution possible of the upper 500m of the ocean. During her two-month journey this seal travelled through at least four distinct regions before losing her tag in the melting ice. The time series are also plotted in 10 day sections with the seal’s location indicated. Some SealCTDs have been deployed in the Great Australian Bight (GAB) and southern New South Wales. The Sea Lions in the GAB appear to have a different profiling strategy compared to their cousins in Antarctica. One GAB Sea Lion spent 5 months of the 2015/2016 summer repeating a transect across the shelf from the head of the Bight. His travels document the degree of uplifted water coming onto the shelf along the bottom and also the development of a deep water salinity maximum (right). Around the globe 2015 was an exceptionally warm year for both land and ocean temperatures. 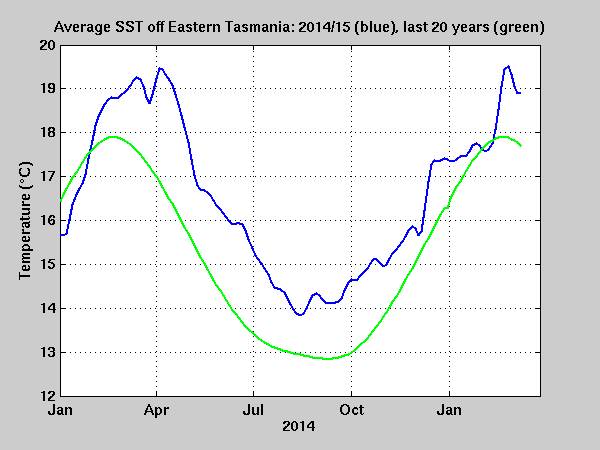 For Tasmania though, the heat continues with sea surface temperatures off the east coast hotter than ever this year. Much of the warming can be attributed to the unusual presence of EAC eddies south of Bass Strait. For example (right) the eddy off NE Tasmania encountered by the Orange Roughy survey team during July this year. Eddies have been tracked travelling down the coast of Tasmania before - what is unusual is the dramatic increase in the size and frequency of these eddies over the last few years. An estimate of the spatially-averaged eddy kinetic energy¹ (EKE) in the waters off eastern Tasmania shows how much the eddy climate has varied over the last 24 years. Throughout the 1990s, EKE south of Bass Strait (blue line) is much lower than that in the EAC extension region just north of Bass Strait (red line). Prior to the 1990s few eddies got past Bass Strait. After the 1990s EKE increased gradually both north and south of Bass Strait. In the summer of 2014, Tasmanian waters saw a huge spike in eddy activity (8 times the average EKE of the 1990s) and since then it has peaked a number of times to levels much higher than those seen before 2014. In that time, EKE in the EAC extension has also increased, consistent with an increase in the strength of the EAC. The influence of these eddies goes well beyond the sea surface temperature. Argo floats sampled the eddy pictured above both at its centre and at its outer edge near the continental slope. Temperatures at the centre of the eddy were more than 2° warmer than the year round average between 100 and 400m depth and almost 1° warmer down to 1200m depth. How much the eddy properties impinge on the shelf is highly dependent on the size and path of each eddy but with their greater frequency and size, these eddies will inevitably impact coastal waters. In July of both 2015 and 2016 there were large eddies off the NE of Tasmania impacting on the eastern Orange Roughy spawning ground during their spawning time. The eddy velocities of over 2 knots (Rudy Kloser, pers comm) persisted for much of the survey² in July this year. How the spawning ground preference and larvae are impacted by the increased temperatures and velocities due to the eddies is unknown at this stage but given that it has occurred now two years in a row we may well find out in the future. Transport within the EAC extension has increased between 1948 and 2014 and is predicted to increase further with climate change. The observed trend in eddy activity over the last 24 years, particularly off Tasmania, is in agreement with the direction of the trend predicted with climate change. The sudden pulses of eddies, which we have seen over the last few years, may be temporary but at this point we cannot be sure. Impacts on the state’s aquaculture and fisheries are similarly unclear at this point but it does appear that the risk of a continuation of recent trends should be taken seriously. ¹ Eddy kinetic energy was estimated using geostrophic currents from the IMOS OceanCurrent gridded sea level anomaly (GSLA DM00). ² The Orange Roughy survey is part of the SETFIA/AFMA/CSIRO ongoing monitoring program. The Niño indices have turned. Nino3.4 and the Southern Oscillation Index (SOI) have been in the El Niño phase for almost 2 years but they have both just moved weakly into the La Niña phase and everyone is waiting to see what the future holds. 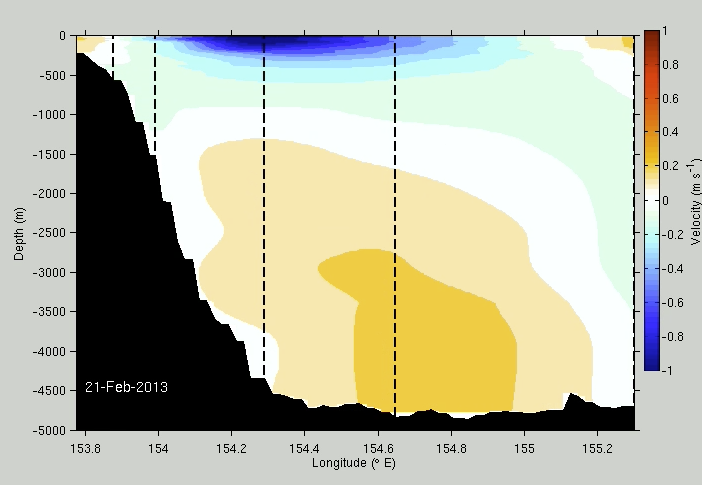 During La Niña the trade winds are stronger than usual, allowing a warm pool of water to pile up north of New Guinea, and altimeter data is showing us that the sea level is starting to rise (right). Sea level anomalies north of New Guinea (SLA-NNG) are strongly negatively correlated with Nino3.4 and both indices have recently jumped sharply. Warm water is more easily evaporated, providing more moisture to weather systems passing over it. With La Niña’s stronger trade winds this moisture is directed over eastern and northern Australia particularly during winter and spring. For Australia, the La Niña event of 2010-2011 was one of the strongest on record, bringing devastating floods to southeast Queensland and Victoria. The high western Pacific sea level anomaly associated with La Niña has consequences for the west coast of Australia: inducing a strong Leeuwin Current and warmer ocean temperatures. 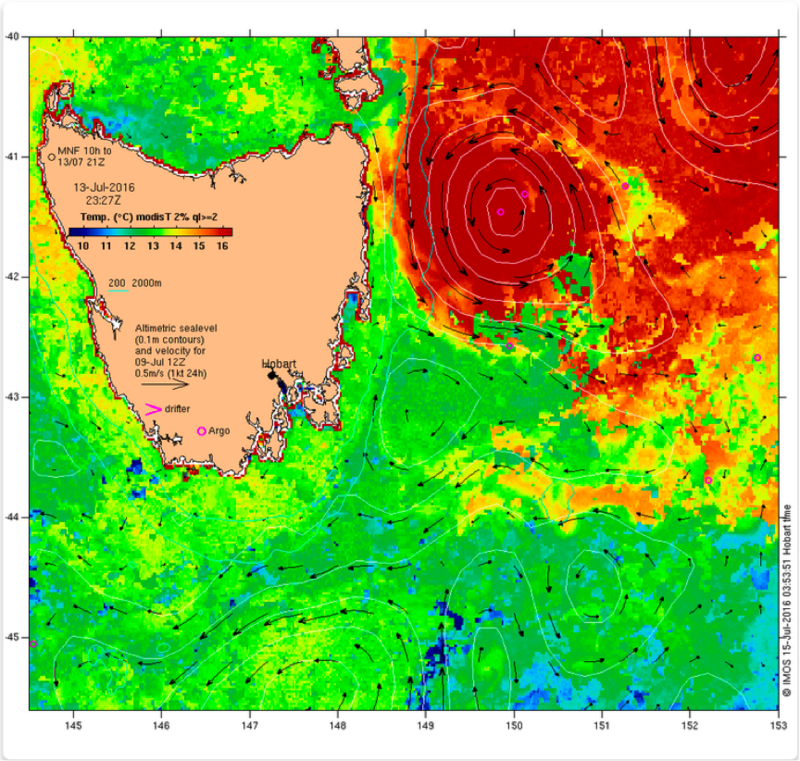 In early 2011, the west coast experienced an unprecedented marine heat wave (Ningaloo Niño) largely due to the strengthening of the Leeuwin Current during the summertime, when it is usually at it’s weakest, assisted by an anomalous heat flux into the ocean. This warming event caused drastic changes in the marine ecosystem and strongly impacted fisheries off the west coast. The Niño indices can give us some indication of what is to come for the summer of 2017 but leading CSIRO scientist, Ming Feng, warns that the contribution of local air-sea coupling remains unpredictable. The satellite altimeters that we use in OceanCurrent for estimating ocean currents also measure the height of the waves. The East Coast Low that has brought flooding to parts of Qld, NSW and Tasmania has also generated huge swell. The downside to these magnificent waves is highlighted by the Bureau of Meteorology putting the coastal regions on high alert. The potential for coastal property damage is increased when the large waves and storm surge occur during king tides. 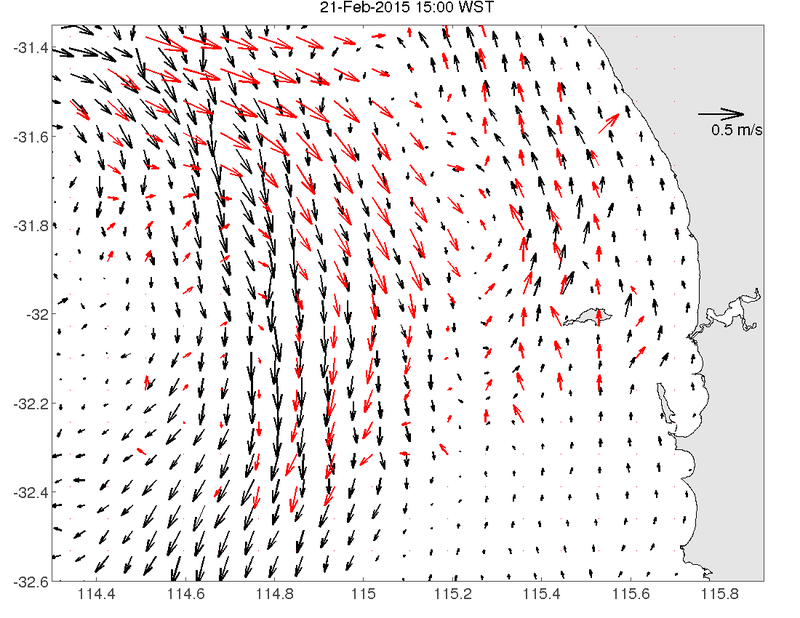 At 8m, the altimeter estimate of significant wave height falls a little short of the predicted 9m but, as the Swellnet team report, the atmospheric build up for this storm set it apart. Significant wave height measured by altimeters (Jason-2, Cryosat-2 and AltiKa) is plotted over the wavewatch3 forecast heights in the Tasman Sea on 6 June (right). The wave field changes quite quickly so we don't expect a perfect match as the altimeter passes included in this plot are up to 9 hours after and 7 hours before the forecast. The satellite wave measurements complement in-situ wave measurements (e.g., the NSW Manly Hydraulics Lab waverider buoys), by resolving the spatial variability of the wave field over a larger domain. Together, they are used to assess and ultimately improve wave forecast models. In recent months, widespread coral bleaching has been reported from the Northern to the Central Great Barrier Reef (GBR). The main cause of coral bleaching is persistently high sea temperatures. This bleaching event has coincided with a marine heat wave on the GBR where the monthly average sea surface temperature (SST) anomaly for March was greater than 1º for much of the Central GBR, and reaching 2º for much of the Northern GBR. 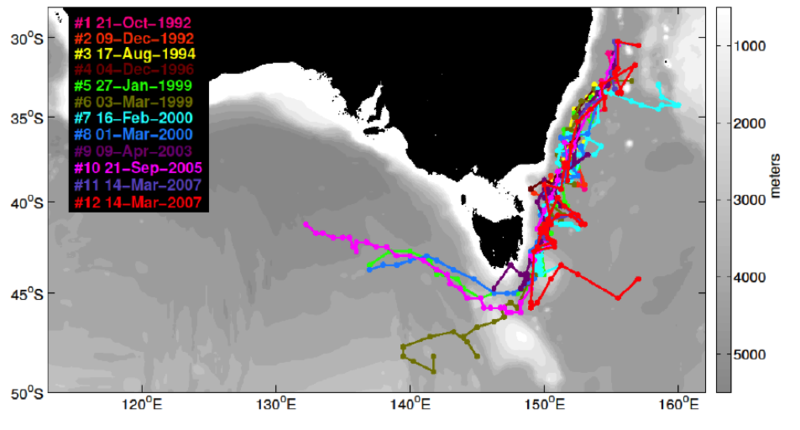 Since October 2015, IMOS and CSIRO Slocum gliders have traversed this region, tracking the seasonal evolution of coastal waters. The intensive missions were principally planned to help validate the eReefs model but have also provided unprecedented observations of the formation, persistence and now waning of the thermal stress of the GBR waters. Glider pilots remotely navigate the gliders through complex pathways between reefs, which can be challenging with strong currents and tides. Gliders are capable of making observations in places difficult for ships and can stay at sea for several weeks. By sampling the water in see-saw manner, the gliders can reveal how deep the warming extends. By April 2016, glider observations indicated water throughout the water column on the inner shelf was still warmer than historical observations. While revealing where the warming occurs, the gliders can also show where cooling occurs. A glider transect in Palm Passage, on the outer Central GBR, detected upwelling, in which cooler water lifts up onto the shelf from offshore. This cool water may provide relief to marine ecosystems sensitive to the marine heatwave. 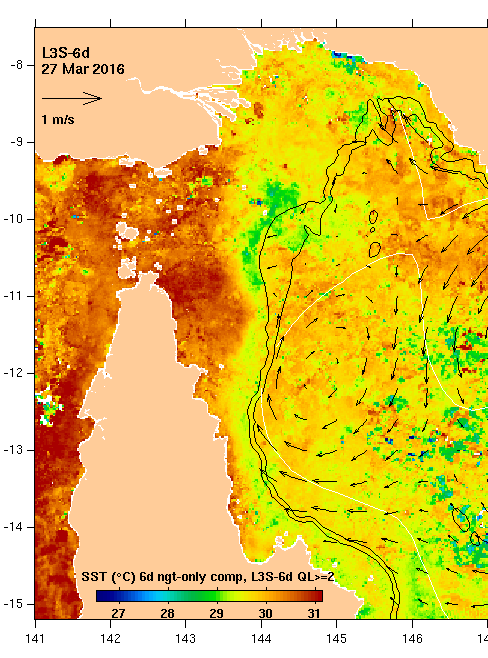 SST from 27 March (below) indicate the outer reef of the Northern GBR, 2-3 degrees cooler, than the inner reef, may be buffered by a combination of upwelling and tidal mixing. In May 2016 two gliders identified the existence of dense shelf water cascades for the first time in the Central and Northern GBR. These cascades can occur when heat loss during autumn causes waters to cool and become more dense near the coast. Both cascades occurred nearly at the same time off Port Douglas and the other off Mission Beach south of Cairns. These cascades flow offshore and can cool the communities living near the sea bed. Ongoing glider deployments into winter will inform how long the warming lasts. The EAC is the ocean boundary current that flows from Queensland to northern NSW. The current usually separates from coast somewhere north of Sydney and then heads west. During the separation process, the EAC forms a large meander that can close off and release large, O(100km) rotating structures called eddies. These eddies carry the warm and salty EAC waters as they move along the “Eddy Avenue”, from their formation region down to Tasmania. They can bring warm water to swimmers in Bondi but also relocate some tropical species down to temperate Tasmanian waters. What happens to these eddies when they reach Tasmania? Do they just dissipate or do they keep going? To answer these questions, ocean eddies were tracked in weekly satellite altimetry gridded maps. This tracking is possible due to their signature in Sea Level Anomaly (SLA) fields. As a result of their dynamics and rotation sense, warm core eddies appear in SLA fields as positive anomalies (i.e. their surface height is larger than the ocean’s mean height). The tracks (see right) of 12 eddies formed in the EAC show their propagation down the east coast of Tasmania, sometimes moving around the island and heading westward towards the Great Australian Bight. This means that the EAC water trapped inside these eddies can reach regions farther than expected. These results suggest that warm core eddies can carry heat and salt from the tropics all the way to the Great Australian Bight. These warm core eddies rotate at ~20 cm/s at formation and propagate at 3-8 cm/s. They can live up to 4 years before slowing down and dissipating completely. Recently, since February, a warm core eddy carrying surface waters of 18ºC has been slowly cruising along the Eastern Tasmanian coast. This eddy has a diameter of ~250 km and could be as deep as 1000 km. That is equivalent to 6.5 Sydney Towers! 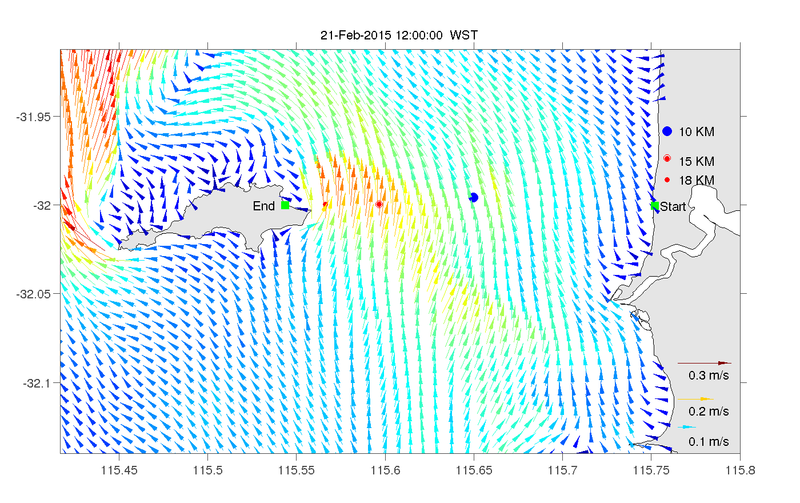 Now, the eddy is about to move beyond Tasmania’s southern tip and continue its journey to the far west (bottom figure). Pilo, G. S., P. R. Oke, T. Rykova, R. Coleman, and K. Ridgway (2015), Do East Australian Current anticyclonic eddies leave the Tasman Sea?, J. Geophys. Res. Oceans, 120, 8099–8114, doi:10.1002/2015JC011026. Ocean western boundary currents redistribute heat around the world and have a profound effect on the world’s climate. The East Australian Current (EAC) is the major pole-ward flowing current of the South Pacific. It provides the dominant mechanism for transporting heat from the equatorial Pacific to the cooler mid-latitudes. Satellite observations show the spatial extent and variability at the surface but the subsurface velocities and properties can extend to depths of thousands of meters and remain largely unknown. Data from the first deployment, April 2012-August 2013, reveal the complexity and dynamic nature of the EAC, including the offshore return flow and the episodic nature of the deep northward undercurrent. The EAC array was designed to capture the entire breadth and depth of the flow. For this reason it was placed off Brisbane where the current is almost at full strength and still in jet form rather than as a complex eddy field found further south. Even so, there are a few days in June 2012 when a rarely occurring eddy pushes the main stream of the EAC further offshore than the 150km extent of the array. 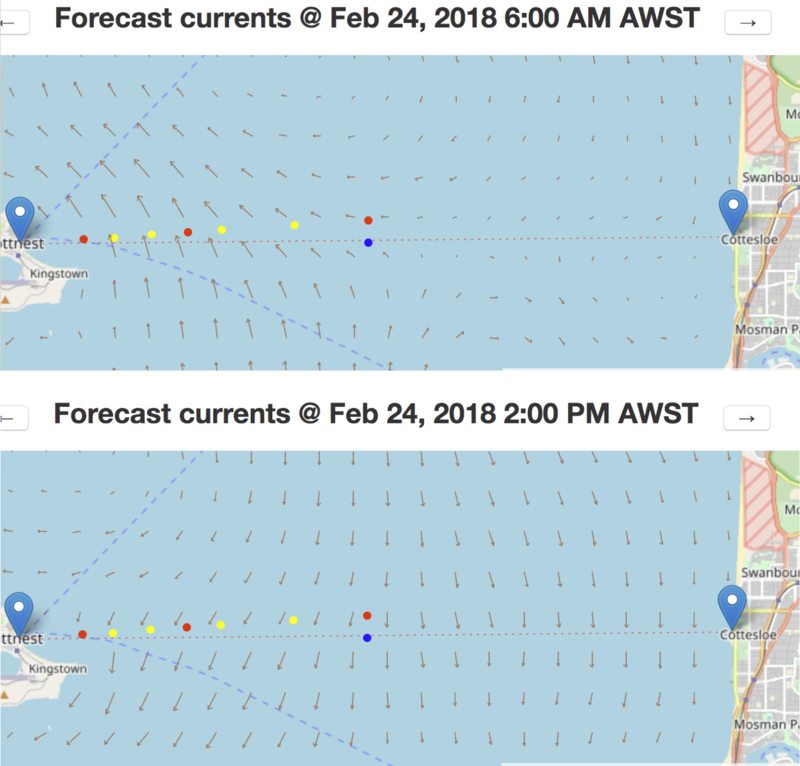 The inaugural Port to Pub race, from Fremantle to Rottnest, is on this Saturday and we have adjusted our swim optimizer to help swimmers make the ocean work for them. The forecast is in and, as for the Rottnest swim in February, conditions are looking good for a fast swim. The currents are forecast to be weak (less than half a knot) and the winds from the east so the waves will be small. 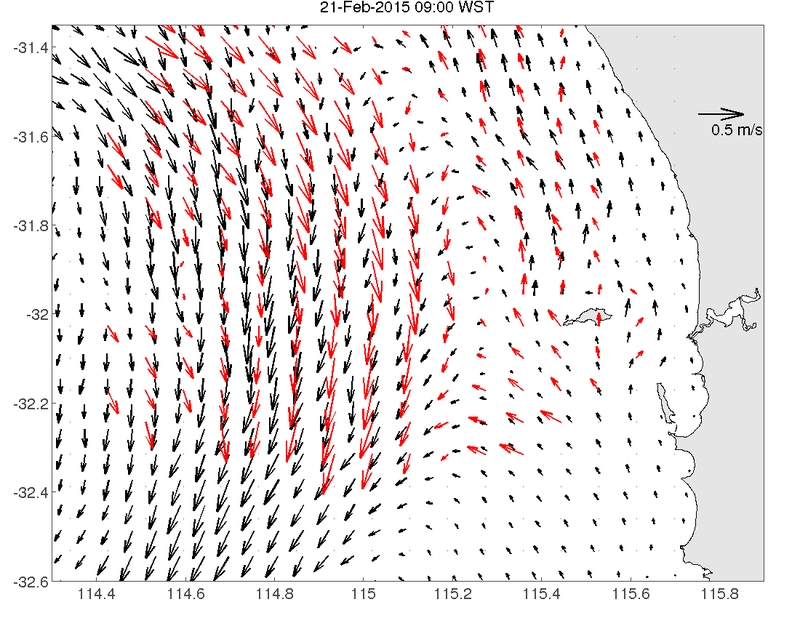 The hourly forecast velocity fields, provided once again by the Oceans Institute of the University of Western Australia, can be viewed using the arrows at the top of the optimizer. The fastest swimmers will find the currents very weak most of the way and may even get a slight assist as they approach Rottnest. Slower swimmers will feel the effects of a weak southward flow, which is expected to develop from 1pm onwards. We have not factored in the extra 5km loop for those brave swimmers who are taking on the extra challenge but you can still use the optimizer for the remainder of the race across the channel by adjusting the start time of your swim. Of course, the forecast currents may differ from those that are experienced on the day. We wish all swimmers a safe swim and a great day. Today’s updated forecast is for weaker northward currents than previously forecast and only occuring in the morning. Later in the day, the forecast is for westward flow providing a small boost to slower swimmers and those starting in the later wave times. The westward flow, however, is highly dependent on small scale weather features which are hard to predict. For the early wave times heading slightly south may still pay off but for anyone who will be still be swimming after noon then heading straight for the finish line is probably your best bet. You can optimize your swim time based on the ocean current predictions by the Oceans Institute of the University of Western Australia. The ocean forecast depends on the weather forecast, which may change. Our last update is Friday morning. 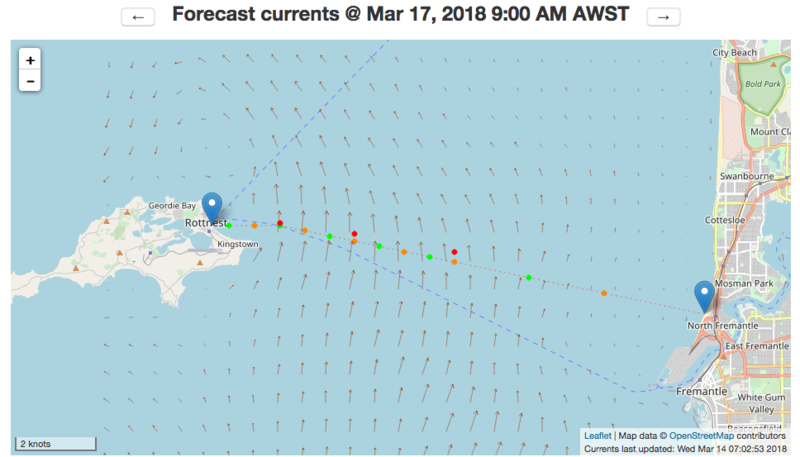 Forecast currents for the race on Saturday are weak currents inshore with northward flow gradually increasing in strength across the approach to Rottnest Island. If these conditions prevail on the day most swimmers will benefit by heading slightly south of the finish line until within a few kilometers of Rottnest. You can optimize your swim time based on the ocean current predictions by the Oceans Institute of the University of Western Australia. The ocean forecast depends on the weather forecast, which may change. Our last update is Friday morning. An IMOS Slocum glider is presently making the most detailed survey ever conducted of the bio-physical properties of a Bonney Coast upwelling event. The dissolved oxygen data are perhaps the most exciting: percent saturation values exceeded 150 within the upwelled water on 3 Feb, confirming that the phytoplankton were very actively photo-synthesizing, producing much more oxygen than was lost to the atmosphere. You can step through the mission seeing either 4 days or 12 days of the mission track at a time. Excepting some spurious measurements affected by bio-fouling, values this high have not been seen in Australian waters by the glider fleet. The closest comparison was in upwelled waters inshore of the East Australian Current near Coffs Harbour in Dec 2010, but these may have been affected by bio-fouling. The present mission DO data are not suspicious, because the high readings occurred early in the mission. The Bonney Coast is the 200km-long stretch of narrow continental shelf near Portland, Vic, that is famous (especially, but not only, in marine scientist circles) for its periods of summer-time wind-driven upwelling. Upwelling events are routinely evident in satellite imagery but rarely sampled extensively at sea. MODIS estimates of chlorophyll-a show that the present event is not an extraordinary one. The track of the glider can be seen in the image at left as a blue line at bottom right. See also the chlorophyll-a images for 1 Feb and onwards, and/or sea surface temperature images. This year, there are two anticlockwise-rotating warm-core eddies and one clockwise-rotating cold-core eddy influencing the current speeds that the competitors in the Sydney-Hobart yacht race will encounter. The cold eddy is off Sydney-Jervis Bay and tending to block the southward flow of warm East Australian Current water. If it has moved little, or west since this 18 Dec image was acquired then yachts may encounter very little current during the first section of the race. South of Jervis Bay, however, the situation is probably very different, because of the detached warm-core eddy off southern NSW, where yachts are likely to find strong tail-current. The third player is the large, but possibly not very energetic, warm-core eddy spanning much of Bass Strait as well as much of the east coast of Tasmania. In between, or embedded within, these large systems are several smaller cold-core features which should also be watched. We wish all competitors a safe but challenging race. 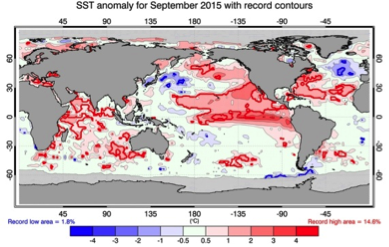 Sea surface temperatures around the globe have been exceptionally warm this year. The 2015 ‘godzilla’ El Niño is responsible for much of the warming in the equatorial Pacific, but the Indian Ocean has been quite warm too. Both oceans contribute to Australia’s climate and a record warming year could have dire consequences for already dry regions of our continent and our neighbours. The warming has been so significant that record warm temperatures have been reached in many places (red contours in plot). In fact this year, more of the ocean has broken records than any other year since 1981. Figures compliment of Phil Reid at the Bureau of Meteorology. MH370: Are they searching in the right place? There has been speculation in the media that the on-going sea-floor search for MH370 is being conducted in the wrong area. This speculation rests on modelling that suggested that the flaperon found on La Reunion on 29 July 2015 probably entered the ocean more than 1000km north of the present sea floor search area. This speculation is at odds with CSIRO, who concluded that the finding of the flaperon “did not cast doubt” on the sea-floor search area. The difference of opinion depends on whether the flaperon is assumed to drift at the average velocity of the ocean’s surface mixed-layer, or whether winds and waves impart an additional velocity. CSIRO argue that the effect of winds and waves cannot be ignored, because the flaperon must have floated within the uppermost few meters of the ocean, where it would have been subject to the Stokes drift, no matter how little freeboard it had to prevent it from sinking. Perhaps confusingly, ‘surface drifters’ do not measure surface drift. They are fitted with sub-surface sea-anchors (‘drogues’) to avoid the effects of winds and waves (i.e. the Stokes Drift). But these drifters inevitably lose their drogues, at which point, argue CSIRO, their trajectories become the best available guide to the likely drift of the flaperon. But the number of drifters traversing the Indian Ocean in the last 30 years is not large, especially if the data set is sub-setted for the times of year appropriate to the drift of the flaperon. Joining near-intersecting trajectories together, however, provides a much larger number of 508d-long trajectories, which is how long the flaperon was in the water. Analysis of these composite trajectories suggests that the present sea floor search area is certainly within the area of likely origin of the flaperon, as shown below. The month-average of sea level north of New Guinea has dropped to levels not seen since the ‘super El Niño’ of 1997/1998. An El Niño event occurs when sea surface temperatures in the central and eastern Pacific become sufficiently warm that the atmospheric circulation shifts resulting in weaker equatorial trade winds. Low sea levels north of New Guinea (a result of weak equatorial trade winds) are strongly correlated with Nino3.4, the El Niño index that relates best to Australian climate. The Bureau of Meteorology declared 2015 an El Niño year in mid-May. Sea levels north of New Guinea have continued to drop sharply since then. The map at right shows the June 2015 SLA for the Australasian region, while the time-series below shows that the average for the region north of PNG (boxed on the map) has only been lower once before since 1992 when satellite sea level observations commenced. Low sea levels in the western equatorial Pacific are also strongly correlated with the strength of the Leeuwin Current. 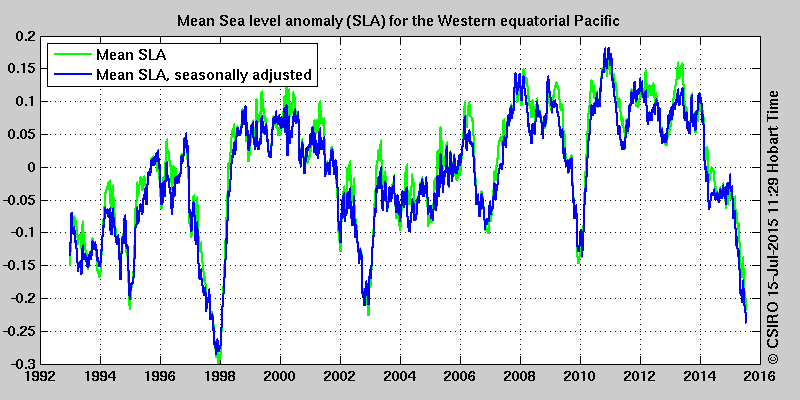 There is a two month delay between the sea level anomaly off Perth and the region north of New Guinea. The low sea level signal propagates southward along the west coast of Australia weakening the Leeuwin Current and causing water temperatures to be cooler. ('freddies') are small, short-lived, rapidly-rotating cyclonic (clockwise) eddies that form inshore of the main flow of the East Australian Current. Larger mesoscale eddies associated with the meandering of the EAC itself were also the subject of the voyage, and since an extraordinary example of a large cold-core eddy happened to be off Brisbane at the start of the voyage, Investigator sampled it from 3 June to 6 June, as shown at right. Note the northward flow where the EAC normally flows southward along the continental margin. On 6 June Iain and his team were excited to see evidence in IMOS SST imagery of the formation of a ~30km-diameter freddy at 32° 20'S, 153° 30'E (50km off Forster) and by 9 June several transects of it had been completed, delivering a wealth of information from the ship's suite of sensors and nets. As anticipated, the ship recorded elevated levels of fluorescence in the freddy, indicative of higher concentrations of chlorophyll-a. See our technical news item if you wish to explore the voyage in more detail. By massive coincidence, the French-Indian AltiKa satellite (one of the altimeter missions on which OceanCurrent depends for sea level information) overflew the centre of the freddy on 9 June, so the matchup of ship and satellite observations will help us interpret the combined dataset in the light of the historical archive of altimetry. The freddy is too small to be resolved in our 2D gridded maps but the central depression of 15cm is clear in the raw along-track data, consistent with ship observations of ~1m/s rotational speed. The Australian National Facility for Ocean Gliders has recently found pockets of dense ‘winter cascade’ water at a surprising number of locations over the continental shelf. These dense pools of shelf water have increasingly been revealed with the high-resolution repeat sampling possible with ocean gliders. The Winter Cascade was first described by Godfrey et al, 1980, with reference to Bass Strait. The mechanism is simple. Sea temperatures are significantly warmer than air temperatures in winter so the ocean loses heat to the atmosphere. Cooled surface water sinks as a consequence of its density increasing. In shallow water, where there is no deep reservoir of heat, the whole water column can cool down nearly to air temperature. Once dense enough, the cold coastal water slides down the sloping sea floor as a ‘gravity current’ to form a distinct layer underneath the warmer offshore waters. 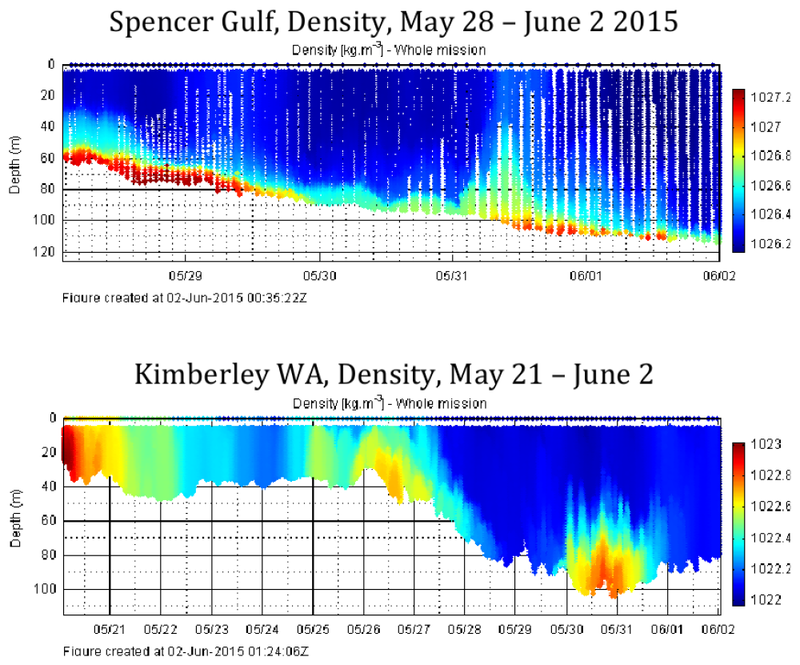 Four recent Slocum glider missions around Australia (Spencer Gulf, Two Rocks in WA, the Kimberley and Yamba NSW) have all just recently encountered dense shelf water pools. How do we distinguish the winter cascade from upwelling? Its not always clear-cut, but distinguishing features of winter cascade are that 1) the coldest, saltiest water is at the coast, 2) it usually occurs on a wide shallow shelf and 3) it is found after cold winds occur, typically off the land, rather than from the upwelling-favourable direction. What does a warm North Pacific mean for us? Early analysis of the warm SST in the North East Pacific is showing temperature anomalies exceeding 4 standard deviations above the mean. This warming began in 2013 and it has been suggested that this may be a new sort of phenomenon not seen before in modern records (http://www.oceannetworks.ca/warm-northeast-pacific-ocean-conditions-continue-2015). Given there is such a significant warming over a long time period, will this have any effect on Australia and our surrounding oceans? 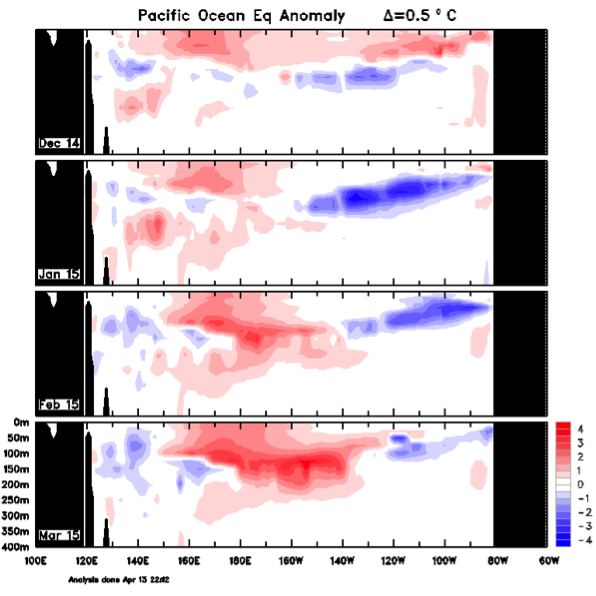 Warming patterns in the north Pacific are often associated with the Pacific Decadal Oscillation (PDO). The PDO is also linked to ENSO and hence Australian climate. There are no indications to suggest, however, that the PDO or ENSO were drivers of this exceptional warming. Early analysis and discussion on forums are linking this warming to a weaker than average Aleutian Low pressure system in the atmosphere. Such a big change in the state of the north Pacific could have indirect effects on the development of other climate modes such as ENSO and the PDO, particularly through changes in the strength of the Aleutian Low. Without historical analogues it is difficult to anticipate how the coming year will play out and whether this warming amplifies later this year if an El Niño develops. The storms that hit the Hunter Valley region of NSW on 21-22 April 2015 caused much flooding as well as damage from winds and huge waves. River discharge mixes with seawater to form a buoyant mixture that can take some time to disperse, depending on the influence of winds and ocean currents. The MODIS satellite image for 25 April says much about the way dispersal works in the ocean. A thin tendril of floodwater, coded yellow-orange in this image, can be seen stretched out along the boundary that already existed between the low-chlorophyll waters of the East Australian Current (coded blue) and the Tasman Sea waters shown in green. Most of the buoyant plume was still close to the coast on 25 April, its seaward edge marked by a sharp but irregular boundary. We will see over the next few weeks where this mass of water goes. The satellite is not our only way of investigating this significant event. An IMOS Slocum glider was also on the job. Its track is shown in magenta overlain on the MODIS images. Its sensors very clearly distinguish the floodwaters from the ocean waters, especially through the impact on the water's salinity and fluorescence. Click forward from 26 April to see the glider encounter, then depart from, the buoyant pool of floodwaters. The observations during the latter half of 30 April show how the seaward edge of the plume is over-ridden by the EAC water because the temperature effect on density is winning against the freshness effect. High estimates of Coloured Dissolved Organic Matter (CDOM, shown on the ANFOG site) in the low-salinity water suggest that the MODIS estimates of Chlorophyll are probably being 'tricked' by high levels of CDOM as well as by the suspended sediments, but nevertheless, can be used to monitor the dispersal of floodwaters. One very important consequence of the runoff may be the input of nutrients (nitrate, phosphate and silicate) to the Tasman Sea ecosystem. 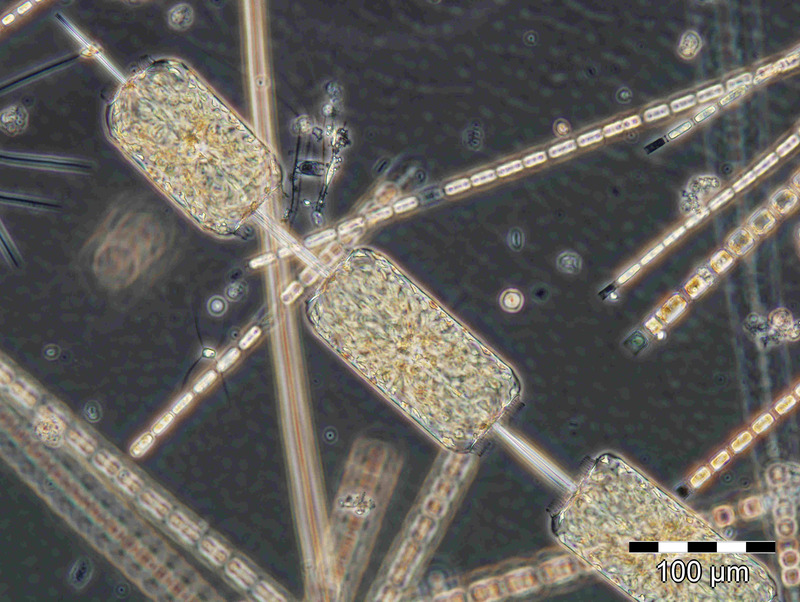 A bloom of diatoms (the preferred prey of many zooplankton, but rarely abundant off NSW) may result from this flood. Shown at right is the diatom Ditylum brightwellii. In the March-April-May period it is difficult to reliably predict the upcoming ENSO phase (known as the Spring Persistence Barrier) until sometime in June or July. Nevertheless, all the signs are there. The big indicator for an upcoming El Nino is warmer than average temperatures along the equatorial thermocline. This is a necessary, but not sufficient, condition for an El Nino to develop. March subsurface temperatures from the Bureau of Meteorology appear to be 4°C above average in the central Pacific. What we are waiting for now is to see if the atmosphere will couple to the ocean to kick off the event. Often this can occur when a Madden Julian Oscillation (MJO) develops over the western Pacific creating a downwelling equatorial Kelvin wave, and giving the already deepened thermocline an extra push. Warm Sea Surface Temperature anomalies are also appearing, but only in the central Pacific. 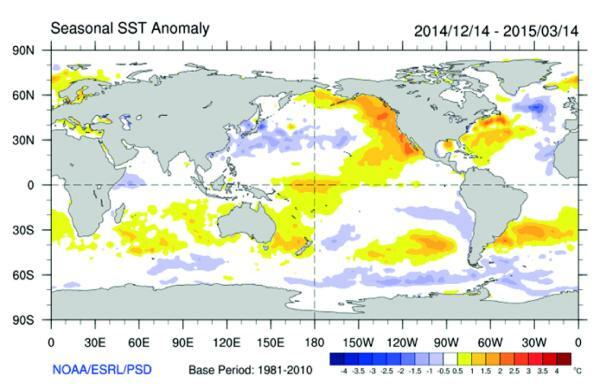 Typical El Nino events require a warming in the eastern Pacific as well. Recently however the 'central-Pacific' type El Ninos have appeared where the warming is primarily in the central regions. On a cautionary note, very similar conditions appeared in April of 2014 and El Nino events were predicted with a 70% chance of occurring. The warm anomalies dissipated however, though the reasons why are still being explored. We have just finished updating all our high-resolution imagery [technical news item]. Two ocean colour images caught our eye. Both show very sharp colour changes between the clear (low-chlorophyll) waters of Australia's warm, southward-flowing boundary currents and higher-chlorophyll coastal waters that are being drawn offshore by the meanderings of those boundary currents. Off Perth, the coastal waters were being drawn into a large anticyclonic Leewin Current eddy on 27 Mar 2009. 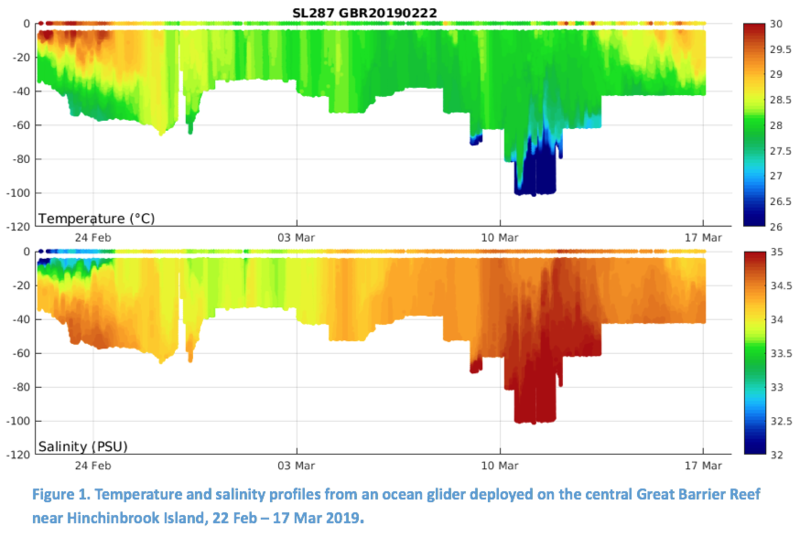 Two IMOS Slocum gliders   sampled the water over the continental shelf out to the front, confirming that what we see from the surface is indicative of the higher chlorophyll at depth (measured via fluorescence) but certainly not the whole story. 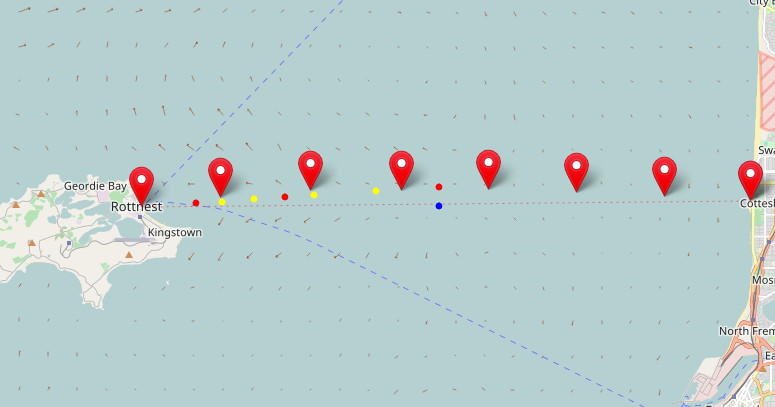 Off Sydney, three IMOS current meter moorings recorded northward motion of the inner-shelf waters on 18 Dec 2013. This is something our estimation of geostrophic velocities is blind to, but is key to understanding the way the eddy-shedding process of the East Australian Current and shelf-slope exchange are linked. Summer is often the time when unusual ocean temperatures have the widest range of impacts, from recreational to life-threatening. Tropical Cyclones Marcia and Lam have just left trails of destruction in Queensland and the Northern Territory and, as usual, the question is whether anomalous ocean temperatures contributed to their strength. The answer to this question lies not in analysis of just the ocean's surface temperature (e.g. our maps of 6-day-average anomalies), because a cyclone needs a deep reservoir of heat for growth, not just a shallow one. That said, the Argo measurements of sub-surface temperature, like the satellite images of surface temperature, were close to normal off NE Australia. The areas of significant temperature anomalies (not all positive) were farther west and/or south. The most conspicuous of these are the positive anomalies off the NW and SE, and some isolated negative anomalies near the coast. The Tasmanian anomaly is mainly due to the East Australian Current continuing to bring more warm water southwards than usual (see https://theconversation.com/things-warm-up-as-the-east-australian-current-heads-south-31889). The graph at right shows that the difference from usual in summer was positive, but not as great as the previous winter, when average sea surface temperature (SST) of the ocean off Eastern Tasmania remained over 1 degree above average. The result of this sustained anomaly was a change in marine life with more tuna and unusual species such as jellyfish appearing on Tasmanian beaches. 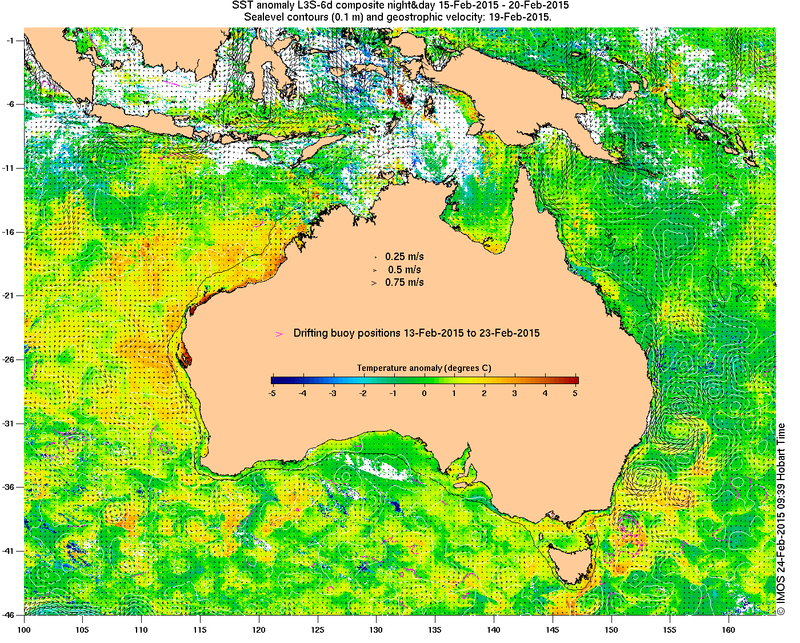 South Australia, on the other hand, has had strong wind-driven upwelling since mid-January. Cold water due to upwelling is a usual summer occurence, but this year it was particularly strong. Less commonly observed are the relatively cold shelf temperatures seen several times this summer as far north of Perth as Jurien, where coastal upwelling appears to have been happening. 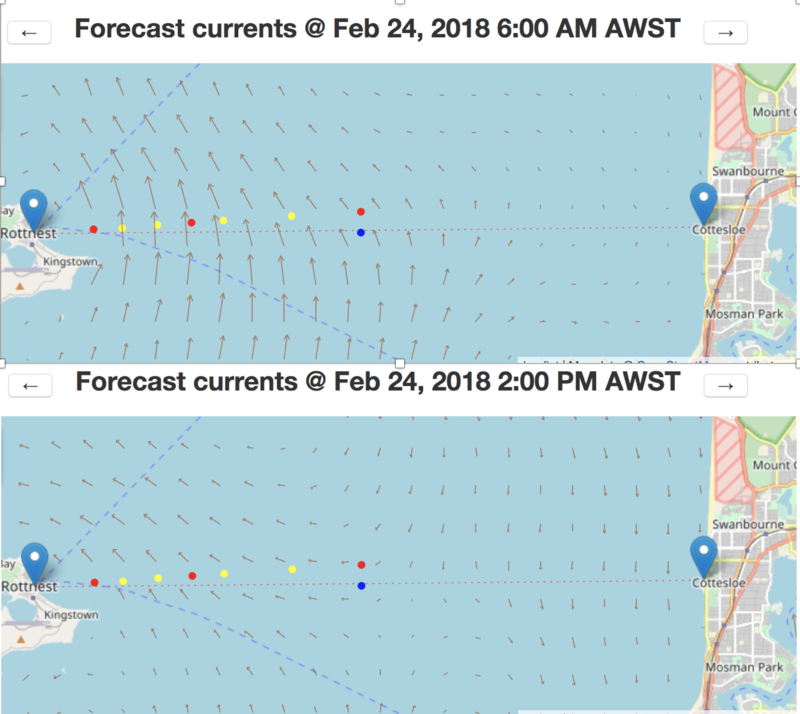 The Oceans Institute of the University of Western Australia have now compared the IMOS HF radar measurements of surface currents (made during the race) with the model forecast issued before the race. These maps below (click to see them enlarged) show the 'bigger picture', showing how the currents in the shallower waters of the continental shelf were going northwards while the currents off the continental shelf were going southwards, as is often the case. The radar does not have such fine spatial detail as the model but does confirm the general pattern, as well as the increasing northward velocities that were forecast. See also the satellite image closest to the time (06:56Z=1456WST) of the race. The radars (northern system in magenta, southern system in red) have detected the northward shelf flow. The altimetry (black vectors) is often blind to these reversals, and is not yet available for the day of the race. The thermal image confirms the usual association of northward winds and flow with upwelling of waters from depth. The Bureau of Meteorology is forecasting southerly winds (15-20 km/h) at dawn then turning south to south-westerly and strengthening (20-30 km/h) in the late morning. 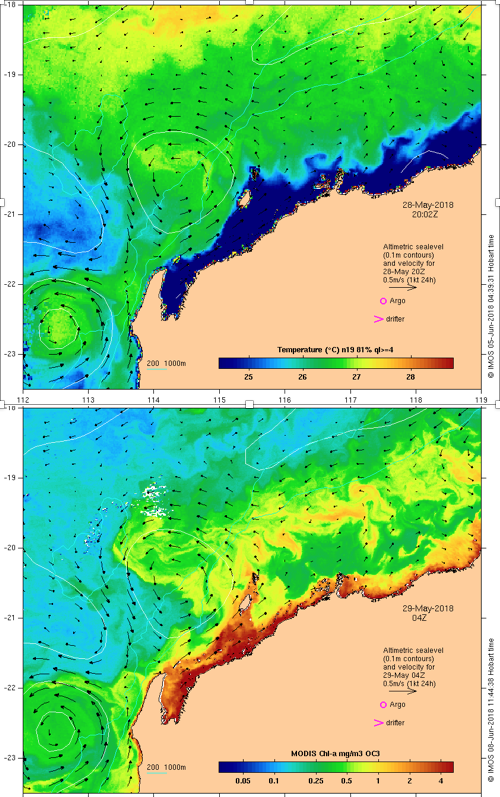 The Oceans Institute of the University of Western Australia ocean current forecast is for northward currents throughout the race, weak near the coast and strongest (0.25 m/s at midday) after the 15 km mark, as shown in the images below. Northward currents are anticipated to increase from midday due to the sea breeze, making the approach to the island most difficult near the cutoff time. 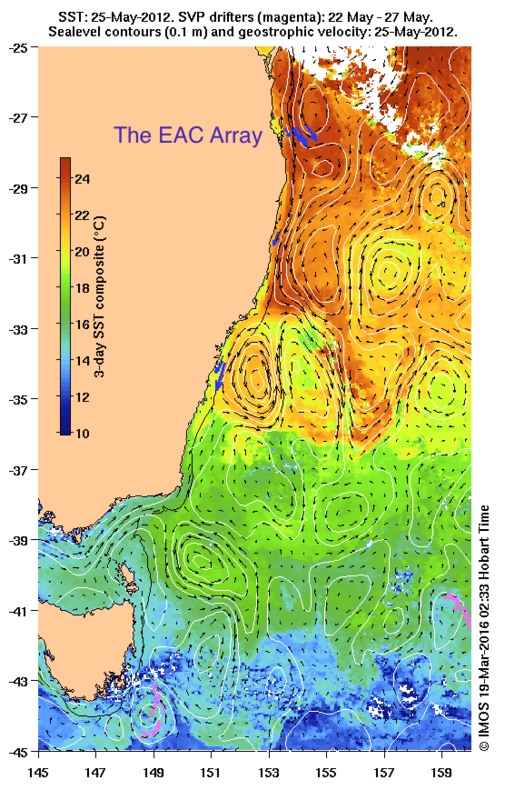 Currents along the Perth Metropolitan coastal area respond to wind patterns. The tides have little influence. During the summer months, the wind pattern between Cottesloe and Rottnest Island is usually dominated by the land/sea breeze system. In the morning, the wind is easterly (i.e. blows from the land to the ocean). During the late morning to early afternoon, the sea breeze changes direction to blow from the south or south-southwest. The sea breeze is usually both much stronger and longer lasting over the ocean than over the land. All of these factors mean that the prevailing currents are usually northward, particularly after several days of sea breezes. This dominant pattern is illustrated above right. The next most common weather pattern for the region features strong easterly winds. The current at these times flows southwards (below right). This happens when we have several really hot days (i.e. high 30's+) in a row. This is what happened in last year's race . The current accelerates locally as it flows around Rottnest Island, so currents are stronger along both ends of the island. As the swimmers start off from Cottesloe, the currents will probably be weak and not have much influence. However, as the swimmers get closer to Rottnest Island (about 2-3 km away) they are more likely to experience strong currents. The direction of the currents would depend on the prevailing wind conditions (see above). These currents may be strong (up to 1 knot or 0.5 m/s).